I turned forty-eight recently. 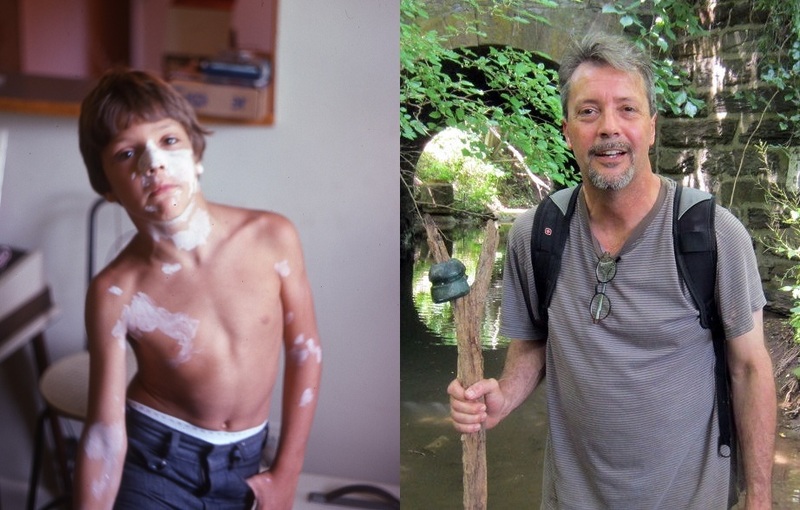 Yet magically, I lost forty years like so many unwanted extra pounds and became eight again. Faster than an innocent baseball through a window, it was an accident. Really. I was just looking for the old town dump. Always on the lookout for antique bottles or any historical treasures, one night on Google Earth, I was checking for elevations and ravines in my little local town by the Susquehanna River. Ravines and downward slopes have always been ideal dumping spots as gravity does all the work. Behind a small street down by the river and just up a ways, there’s a sharp 50 foot drop in ground level. I knew from many drives along the Susquehanna River there was a creek back there, Staman’s Run. When I was eight, a creek was my favorite place. Full of crayfish, salamanders, snakes, frogs and turtles. My tastes have changed slightly in 40 years. This time I was going to focus less on slithering, slimy, and crawly finds. 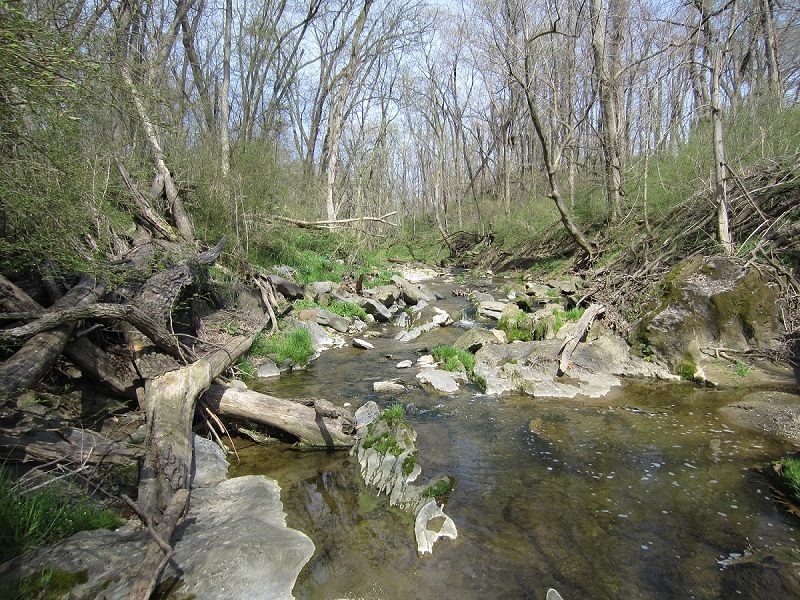 I knew this creek, with it’s sharp drop in elevation, was definitely a site worth checking out. Rousting my friend Dave the following Saturday, we decided to walk the creek to see what we would find. Parking downstream close to the river, Dave and I found a spot where the access to the creek wasn’t too challenging. The first thing I noticed were the results of exceptional precipitation this past winter. The second thing I noticed was the above natural rock formation that has an artsy fish skeleton look. Even though it was my first time visiting this creek, I could tell by the sizeable deadfall of trees and limbs that a torrential amount of water had moved through here. I love nature. Absolute chaos. Yet order. Everything so perfectly placed. I knew there had to be something old and possibly good exposed along, or in this beautiful northern stream. All the while I was daydreaming like a kid on a treasure hunt of finding the old town dump full of rare 1800’s bottles and relics. It was only a few minutes before I spotted something. It was not at all what I expected to see just laying there on the middle of the 10 foot bank in the soft dirt. I was pleased to meet a very old street paver named Clydesdale. Street pavers were in use during the 1800’s through the early 1900’s. From the singsong clop of horses and carriages to early automobiles, these old pavers have been trod upon with history and are quite collectible. The 8 year old in me liked it right off, as I had never encountered a brick with a name before. 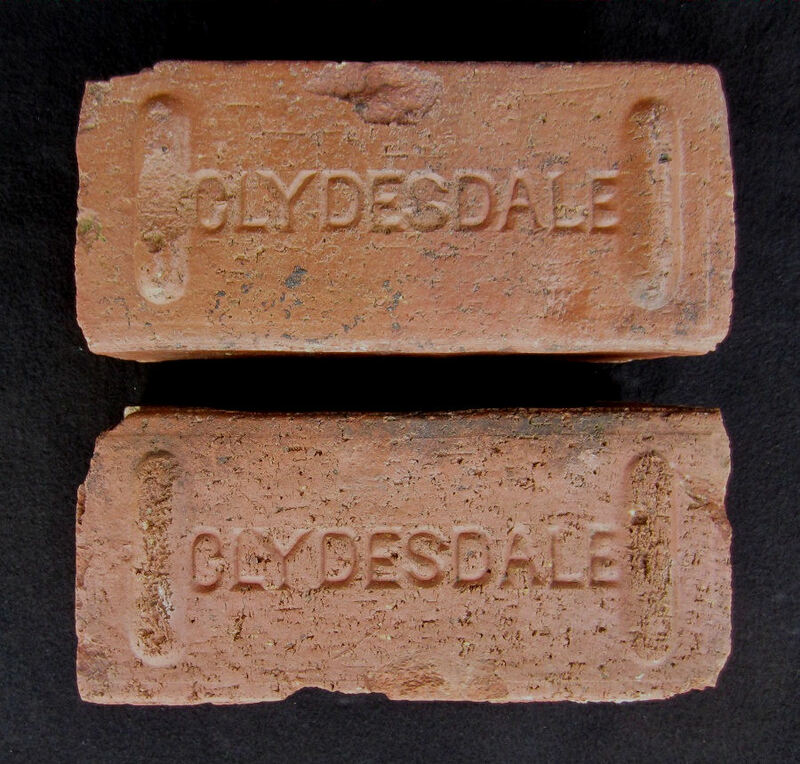 I later did some research and found a Clydesdale Brick and Stone Company out of Ellwood City, Pa. that was in business for only two years, 1928-1930. 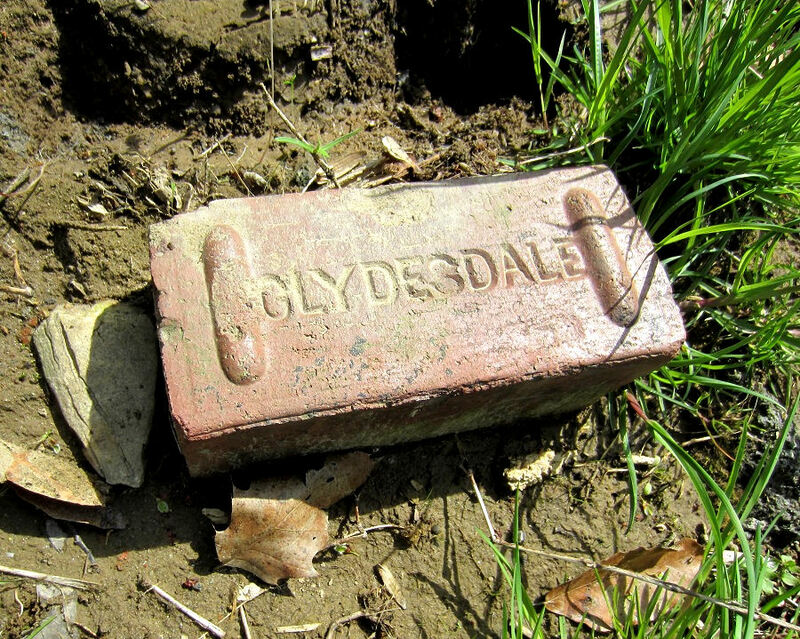 I also an found an older Clydesdale Brick Company out of Pittsburgh that dated to the 19th Century. It could be either, yet I suspect this is from the Pittsburgh company as far more street pavers were made then. Coincidentally, the 48 year old me was in need of about a dozen bricks for a porch flower bed project to hide the furnace tank oil pipes that jutted up from the basement out into the flowerbed. To find larger, interesting bricks with names on them would be quite the antique, historic bling to hide the unsightly pipes among the shrubs in front of my porch. Getting more of these and hauling them and myself safely out of the creek up a steep bank is another story. These paver type bricks are larger than a standard brick and are extremely dense. This Clydesdale street paver is only 9″ x 4″ x 3-1/2″ yet weighs a whopping 10 pounds. The name is molded on the side and the top edge is what would be exposed to street wear. These were made to last and this one certainly did. I stashed it out of sight to be picked up on my way back. Poking around that spot on the way out, Dave found another and so did I, but those were the only three Clydesdale pavers that we found. Two very old street pavers brushed and rinsed and dried. They are in remarkable condition considering what they’ve endured since their manufacture to ending up where I found them. 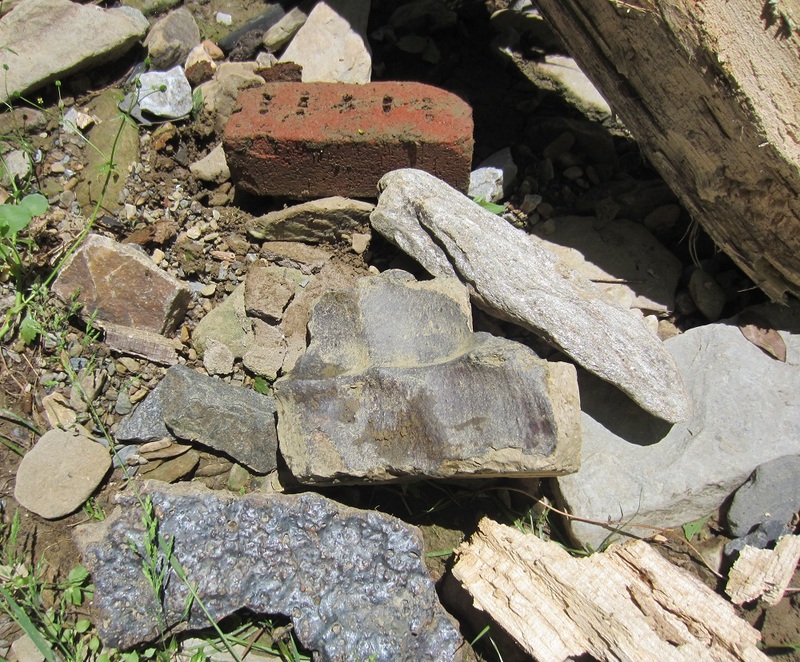 We continued upstream and noticed fragments of glass and even a piece of flow blue ironstone, but when we got to the steep ravine, it was all natural and no signs of a dump there. So far, it was the street pavers that intrigued me and how they got there. 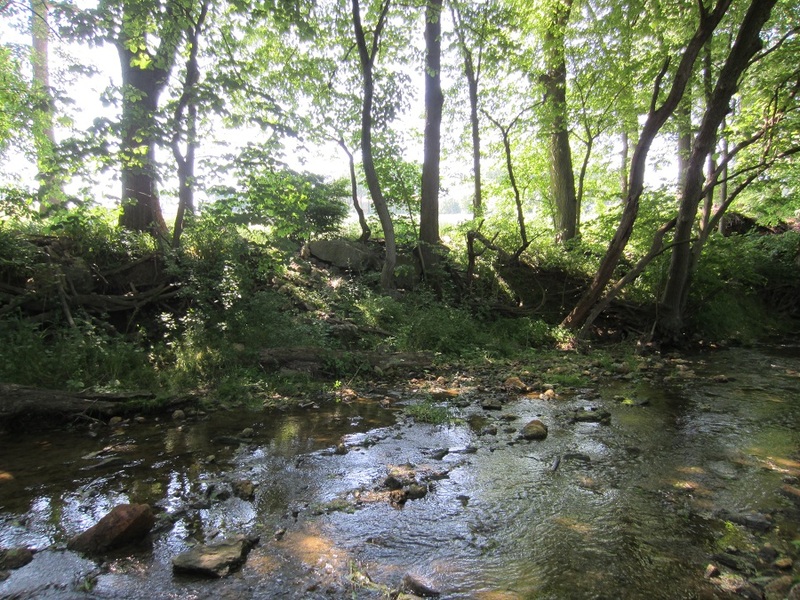 I made it a point to explore this creek further as the Susquehannock Indians, a branch of the Iroquois, had settled here around 1580. How ironic that I would later find out that the top of the ravine, at whose base I was looking for an 1800’s dump for old bottles, was where the Susquehannocks had a main settlement. The next Saturday I wanted to explore further. Dave had family obligations, so I went it alone. The very first thing I did was startle a small snake which went the other way. Venturing further upstream this time, I noticed that the creek was scattered with red bricks, not pavers, these were mostly standard size. Some of them were clearly smaller, very crude, and obviously very old and hand made. 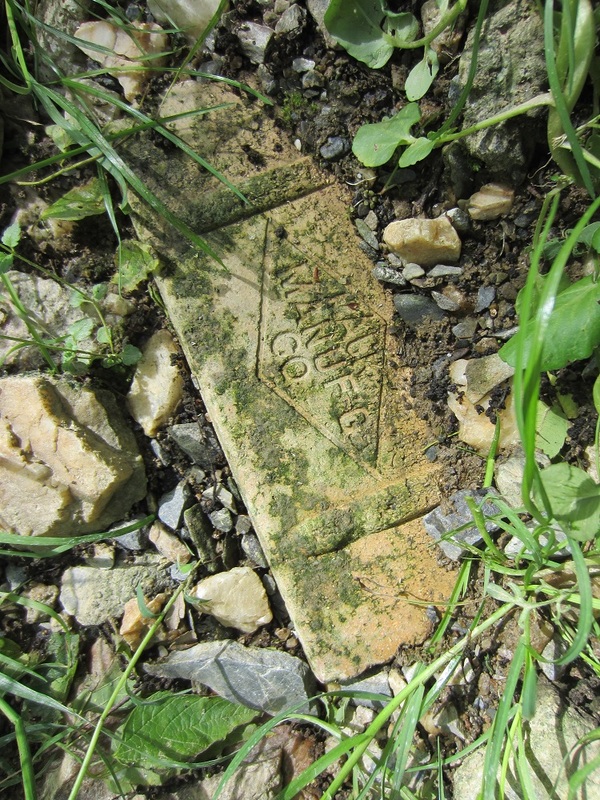 I had read that some very early handmade bricks were sometimes hand signed with a knife or tool with a maker’s name or initials and sometimes a date before they were fired. I flipped every one I saw so as not to miss any like that. I didn’t find any signed handmade bricks, (yet) but I will keep an eye out for them. I did notice that along the creek bank on the farm field sides were occasional ‘dumps.’ Consisting of whatever the farmer dumped, or allowed to be dumped there, these scattered areas held a various assortment of debris, mostly bricks, asphalt chunks, old brown clay pipe, metal scrap, sometimes bits of old household items such as white ironstone china pieces, not to mention the possibility of an occasional Indian artifact. These bankside dumps held my attention whenever seen. 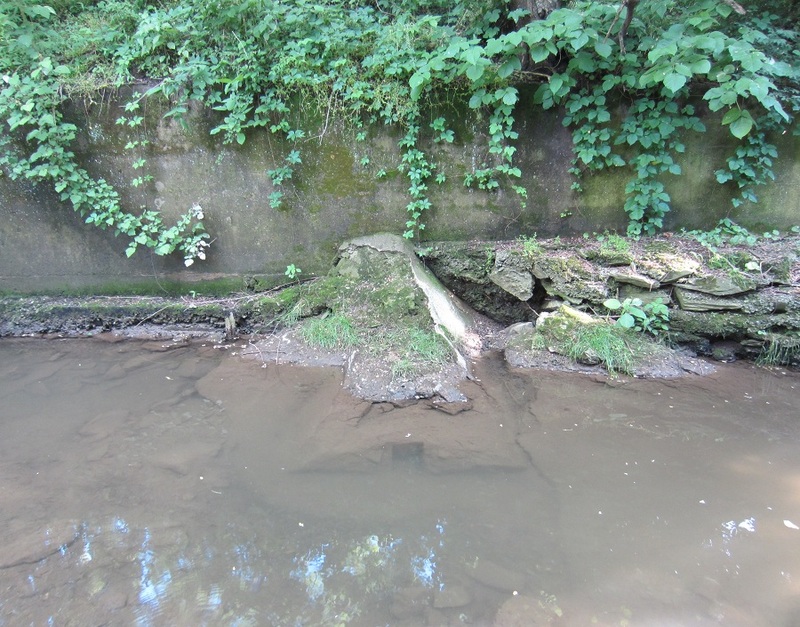 Below is an example of a farmer having pushed debris to the edge and down the bank. In the center of the two trees where the large rock sits was a plethora of interesting items, none of which were valuable, but these sites are something to keep an eye on as a grooved Indian axe head could easily end up here, pushed from the fields where the majority of Susquehannock Indian artifacts are found. At the very top of this dump, and still up on the field, I came across two very interesting objects. 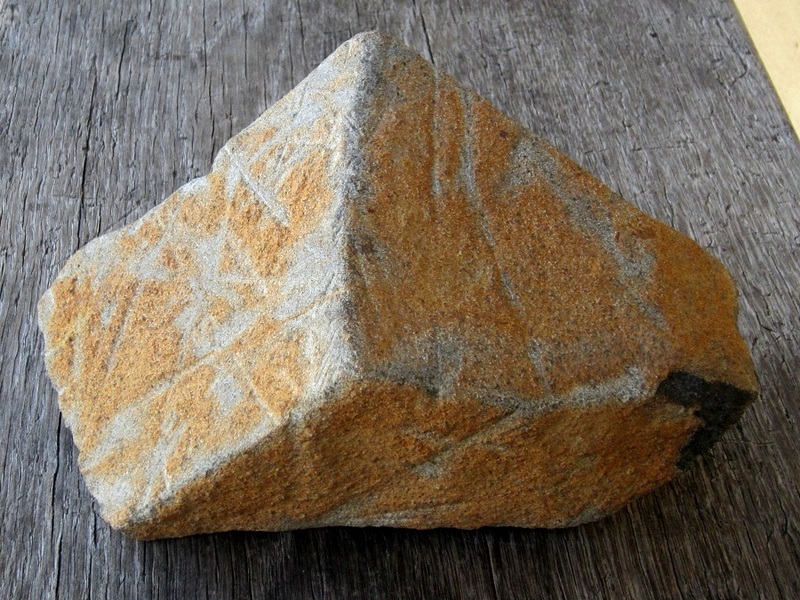 The first being a medium sized stone with what appears to be an orange ochre glaze covering all but the bottom, and symmetrical line marks resulting in a series of triangles across the main face of it with other lines and marks on the sides. This is either a naturally ‘coated’ orange stone with gray underneath that has disc marks from repeat run overs from a farmer’s tractor tilling, or, it could possibly be an Indian boundary or territorial marker. Very interesting, but I’ll probably never know for certain. 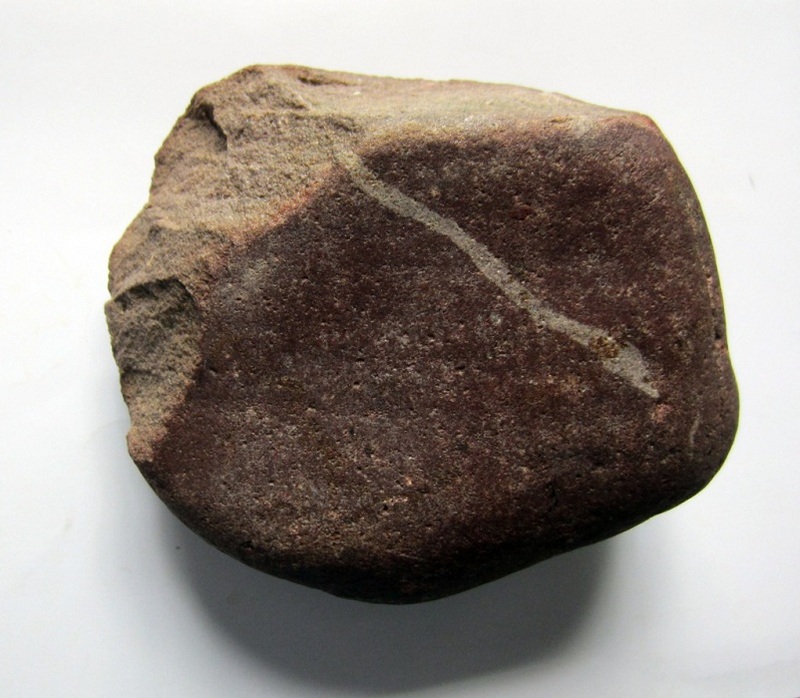 It’s a heavy stone and weighs 5.6 pounds. 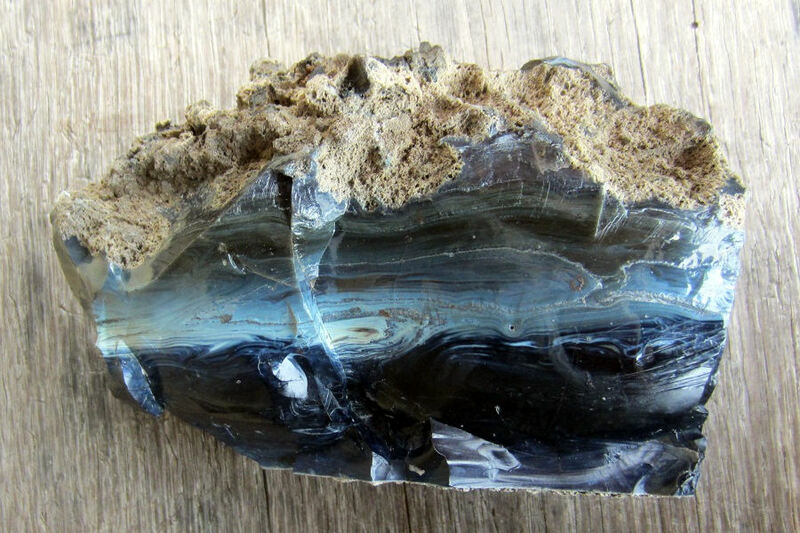 The second object found within five feet of this mystery stone looks to be a large hand chopper. It fits perfectly into my hand and appears to have been flaked to an edge. 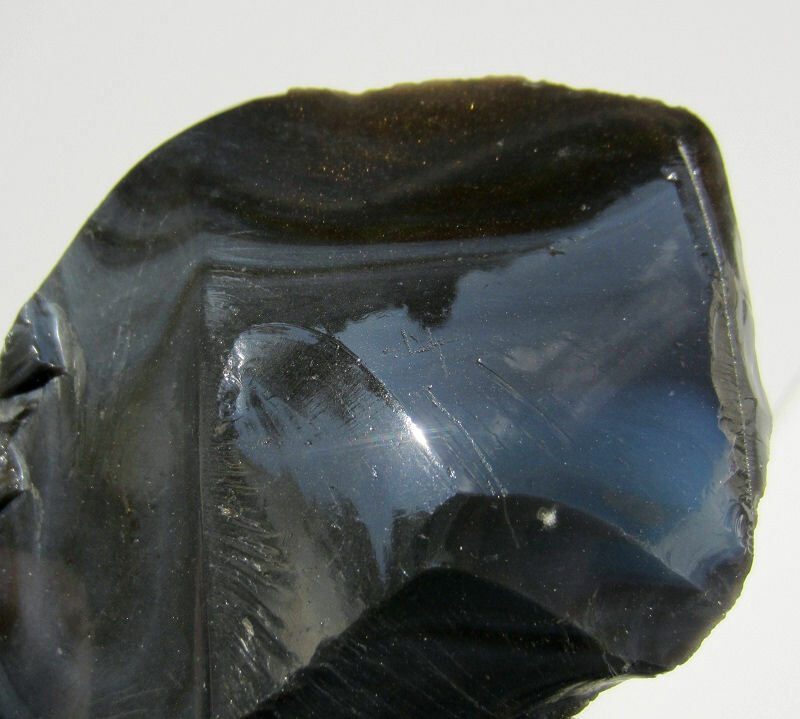 Most intriguing is it’s color purple, as the Indians used to fire harden arrowheads and stone tools and this procedure would turn the stone a purplish color. This possible chopper weighs 3.4 pounds and like the lined orange stone will have to be shown to an archaeologist for final identification. Note what appears to be a white snake either natural to the stone or possibly painted on before firing if it is an Indian tool. Heading even further upstream, (I estimated a 20 minute walk, so could have been an easy mile,) I came upon another larger dump. This was evidently a section of street construction, very likely from the nearby town of Columbia, Pennsylvania. Columbia is a very old and beautiful town, great for it’s antiquing. I can’t just sneak by mentioning this town’s name without discussing some of it’s little known but spectacular history. In the early 1700’s John Wright built a ferry crossing the Susquehanna River and the town was called Wright’s Ferry. It was later renamed Columbia after Christopher Columbus. In 1789 it was suggested ideal as the nation’s capital. In 1790, when the Continental Congress voted on where the new nation’s capital should be, even George Washington liked the idea of Columbia as our capital. It lost by one vote. 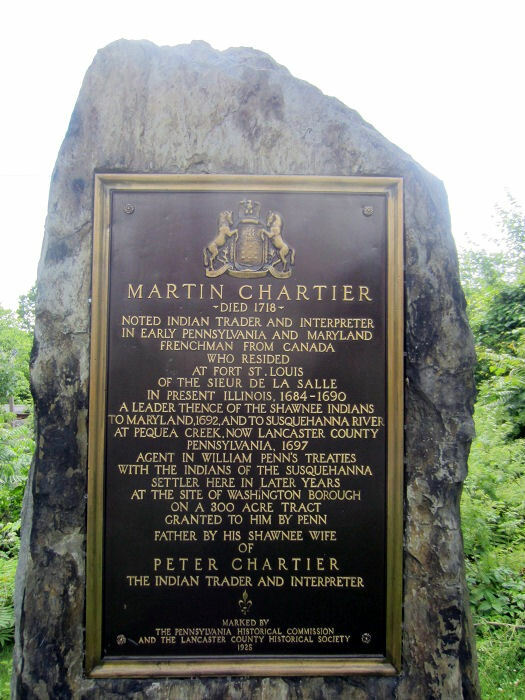 It later lost to being Pennsylvania’s State Capital to Harrisburg, also situated on the winding Susquehanna River, yet more geographically centered in the state. Also interesting is Lancaster County’s being Pennsylvania’s fourth county, founded 1729, formerly part of Chester County. There is a staggering amount of history here, see below monument erected in 1925 literally just down the road from this creek. Behind this plaque is the Susquehanna River. 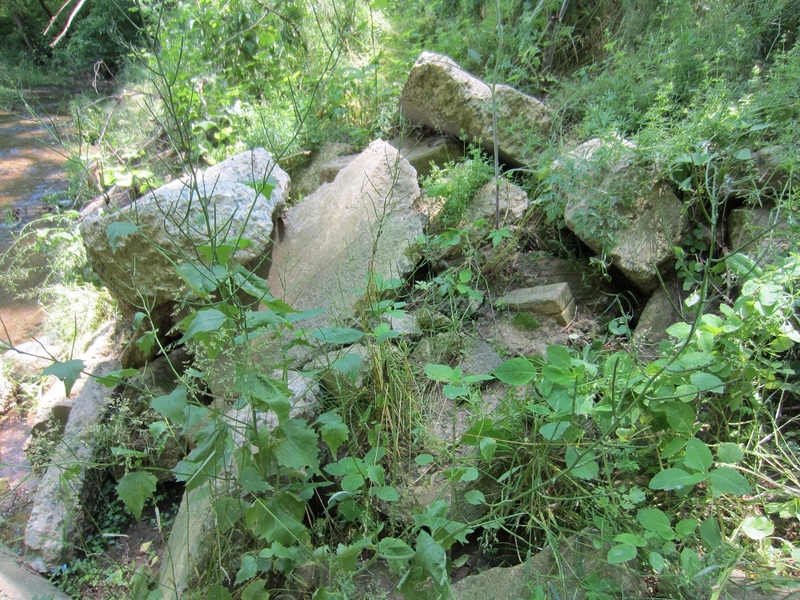 Basically a heap of old concrete pieces, yet notice center right. A tan, sandstone colored street paver. This one was embedded and I could only get this image of it, yet I was to find examples that were not only free from cement, but had traveled a good ways down from this site by the natural force of water. This had been dumped here long ago and the pavers I found here were of three (so far) different brands and not a single Clydesdale. This dump was a good three quarter to full mile up from those Clydesdale pavers we found. Below photograph is of a signed paver exposed. I spotted this one well before I came to the main dump. Prior to this past torrential wet winter, there may have been two feet of earth and rock over this. This signed paver was firmly settled and took some digging around it to get it out. This was a Mack Manufacturing brand paver. This was the most common brand of the 15 pavers I labored to haul downstream and home. A Swiss Army backpack I picked up years ago in Wyoming could handle the 40 plus pound load with each of 5 pavers I carried at a time weighing 8 to 10 pounds each. Talk about eating your Wheaties, this got me in shape in no time. Mack Manufacturing of Enfield, Connecticut, has been in business since 1830, and still is today. These likely date to the 1890’s to 1915 era. Note the top one has a serious amount of street wear and saw a lot of foot, horse and buggy and possibly early automobile traffic to wear it down a good quarter inch. Below is a shot of two pavers just out of a deep silty pool, mostly buried, with only moss flowing off straight edges to indicate they were there. 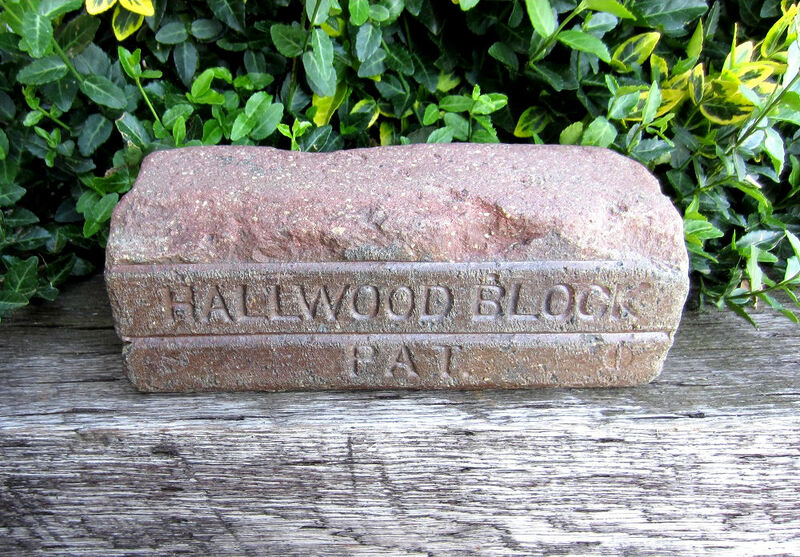 As seen above, I came across an example of a Hallwood Block paver. 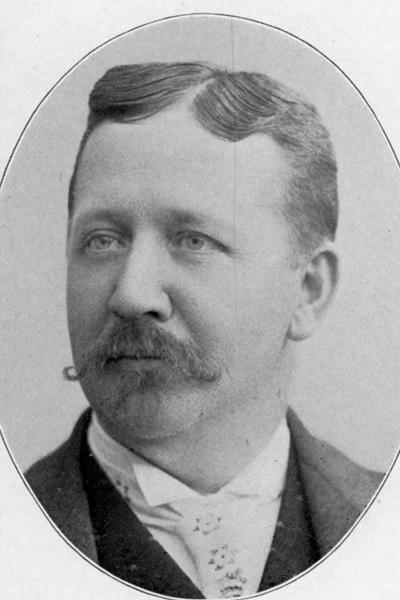 The Hallwood Company was started by Henry Hallwood in Columbus, Ohio, who, in 1886, made what was considered to be the strongest and most durable street paver. His unique patented pavers were double grooved to sit firm in the ground. The City of Columbus paid a .30 cent premium for Hallwood’s pavers. Henry had a sense of humor. His pavers feature molded screw heads in each corner along with the grooves and his name. His pavers were tough and the best quality of the brands I found. The density makes them ring when tapped together. Doing quite well with pavers in the prime of the Industrial Age, Henry realized there was more money to be made in machines. In 1887, he bought a patent to a simple cash register and ended up becoming a serious business rival with National Cash Register, with lawsuits, spying, and being sued and Hallwood counter-suing NCR due to patent infringement. Henry Hallwood won the legal battle, which had become very ugly and settled for some $250,000.00 in 1913. He died in June of 1918. How interesting to find street pavers made by a man in a city named after Christopher Columbus from a street in another city named after Columbus. You sure can learn some interesting history just hiking up a beautiful creek. 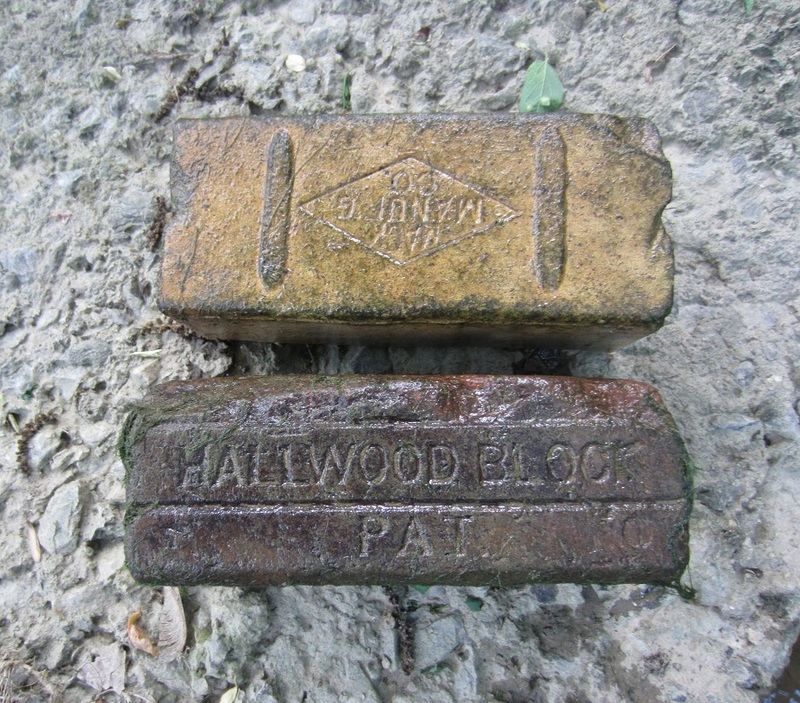 Below is one of only two Hallwood Block street pavers I recovered. Note the molded screw heads on the base corners. The worn top is the street surface and running your hand across it you’ll find it’s smooth as silk. The paver is perfect as when it came out of the street after years of wear from horse and buggy and foot traffic. It’s not a perfect example, but is as used, which is even better to me, as it tells its tale. 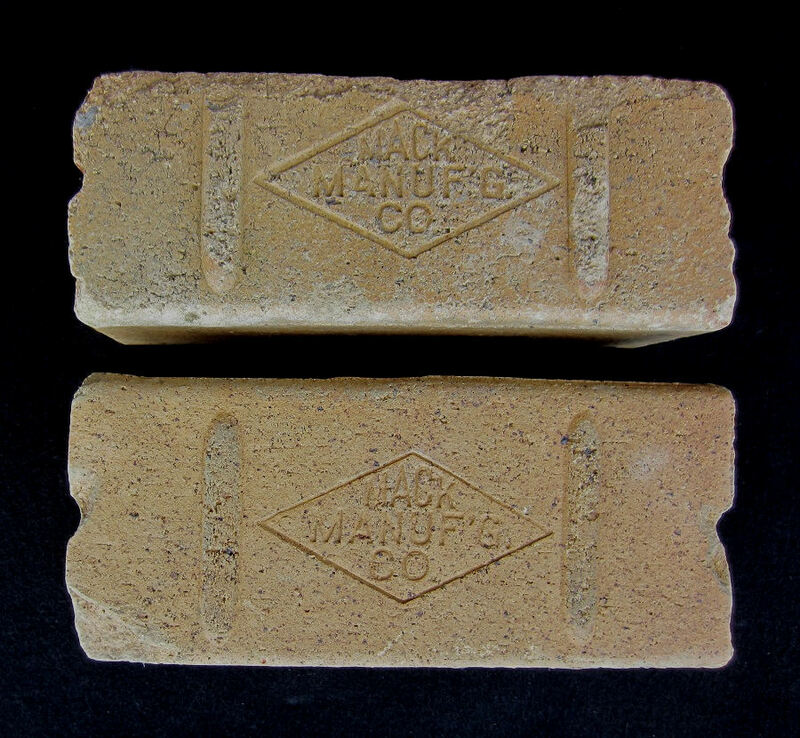 There was also a Clearfield brand paver, tan colored like the Mack pavers. The Hallwood is my favorite due to it’s character and history. I recovered some 15 pavers, including 2 blank ones, one burgundy and the other an orange color. None of the pavers weighed less than 8 pounds. I relayed them down stream in stages to get them to the car. There was no parking in the mile or more up this creek. I quickly learned to hide items and make stash spots in order to retrieve them later. 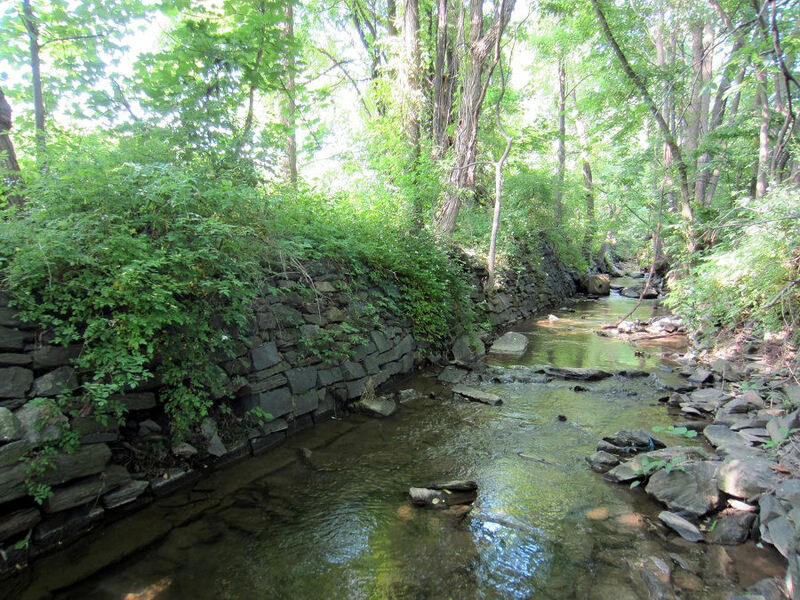 So, after exploring this creek, of which I never could put a name to, and having acquired some interesting pavers for my porch project, and a couple of possible Indian chin scratchers, it was on to the next creek to see what it held. Schulman’s Way is just a mile north of Staman’s Run, and features the local swimming hole, used for the past 50 years or more according to a friendly farmer I encountered. This creek illustrated both history and wildlife that were quite fascinating. 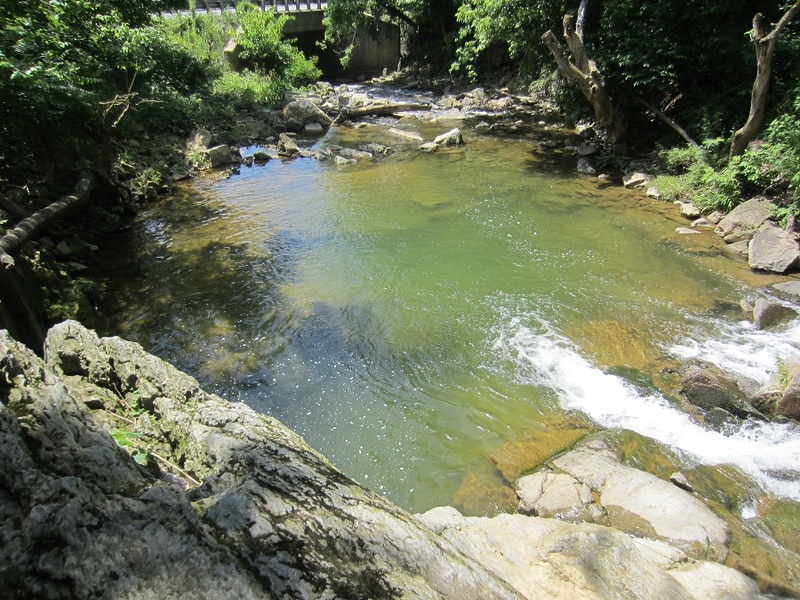 Below shows the ol’ swimming hole still used by the local children. Just below and past the swimming hole is River Road and beyond that the modern railroad and then the Susquehanna River. 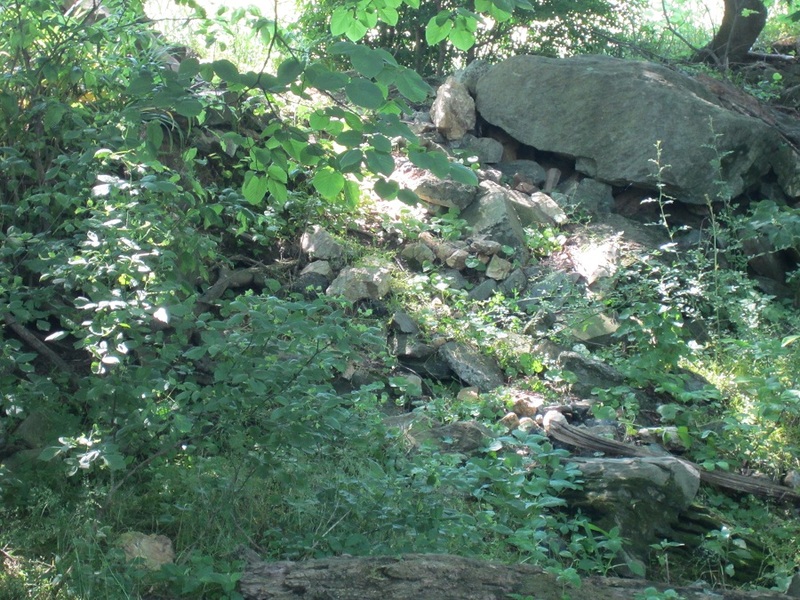 Shown below, is a shot looking straight across at a very unusual large wall, comprised of a very unique mix of concrete, from rocks, river stones and brick and brick fragments. I have no idea how old this wall is. 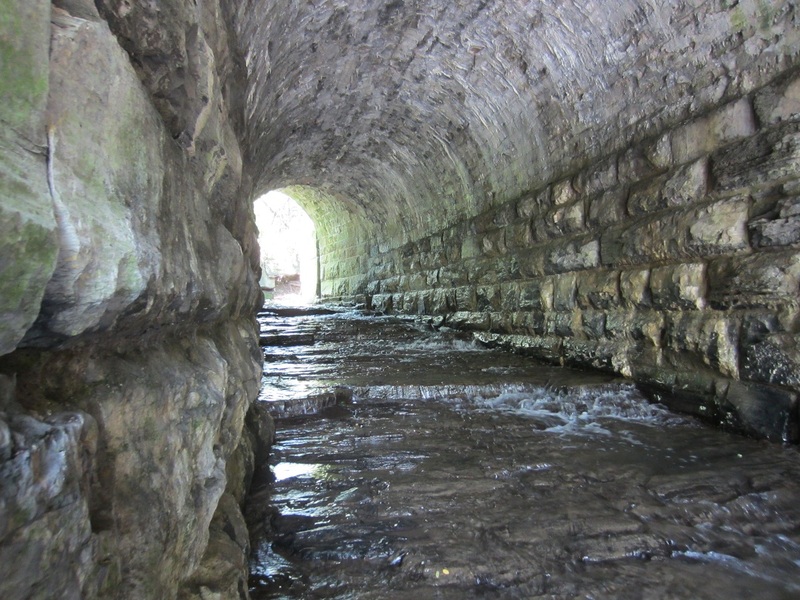 It’s possible it may have been used to channel water for use of power as there may have been a mill here long ago. 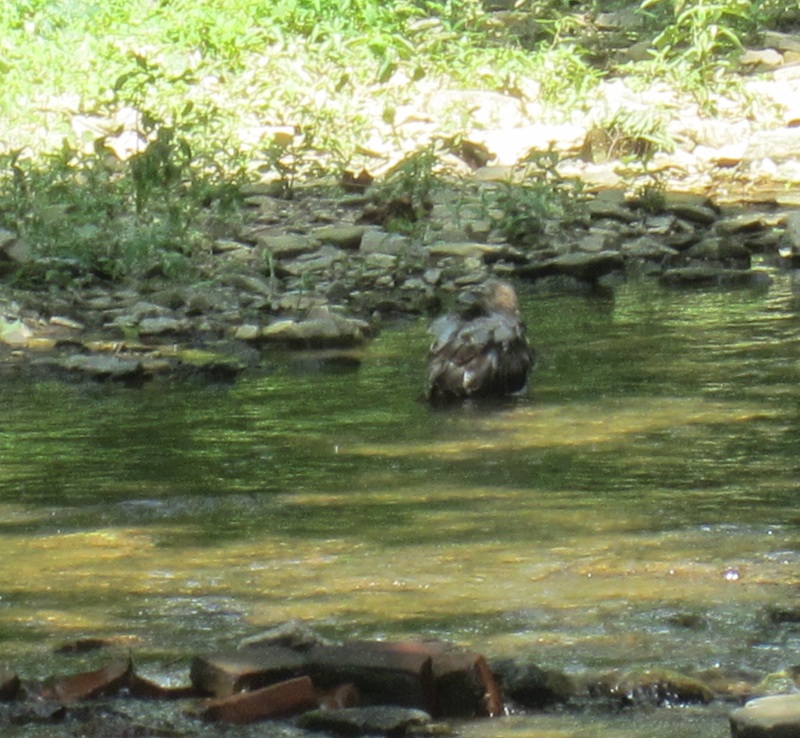 Glancing upstream I was delighted to see a large hawk taking a bath. Also note the amount of bricks simply washing down this stream. 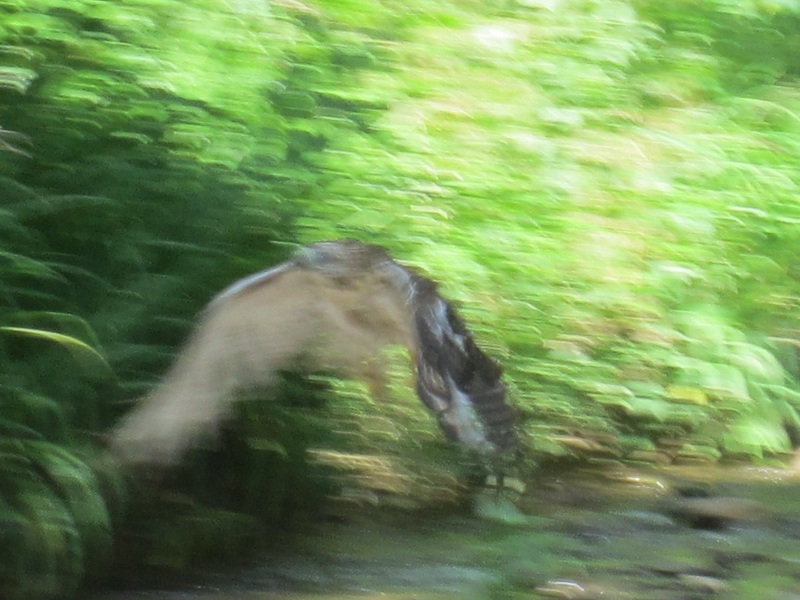 The next shot was a quick attempt on my part as this now wet, but clean hawk was flying towards me. Not an easy shot, yet I like it despite the blur of movement, as I had to follow him with the camera, which was tricky, as he was fast. 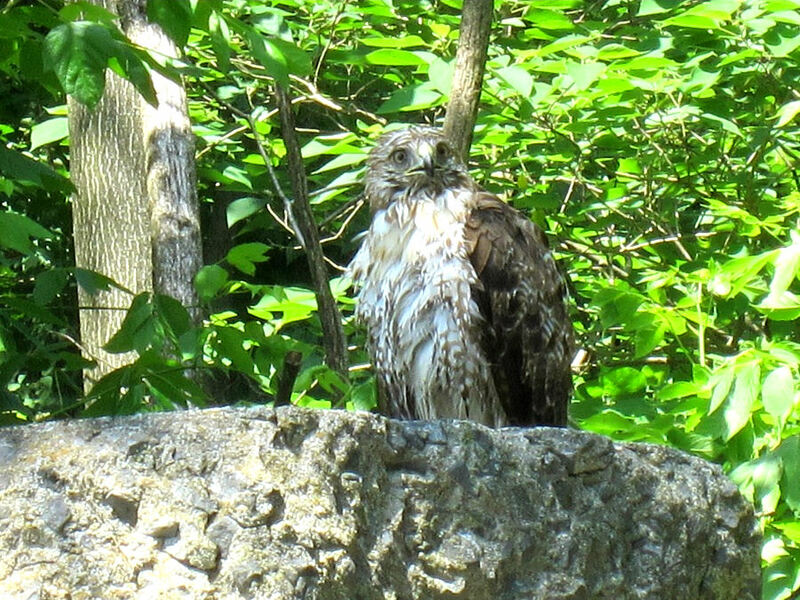 Guess where he perched to dry in the sun? Right atop the old wall. He looked around, and then stared straight at me. Wow. He flew away and I made my venture upstream. This turned out to be a very interesting creek and there was more history and wildlife to cross paths with. Having moved past where the hawk was I ran straight into a brick wall, only it didn’t stop me, but it was intriguing to see where it was located. Up a little further I did find evidence of a furnace on this creek. Below is a shot before I touched anything, showing a three brick section of light tan aluminum and silica based brick made to withstand the high temperatures of melting iron. 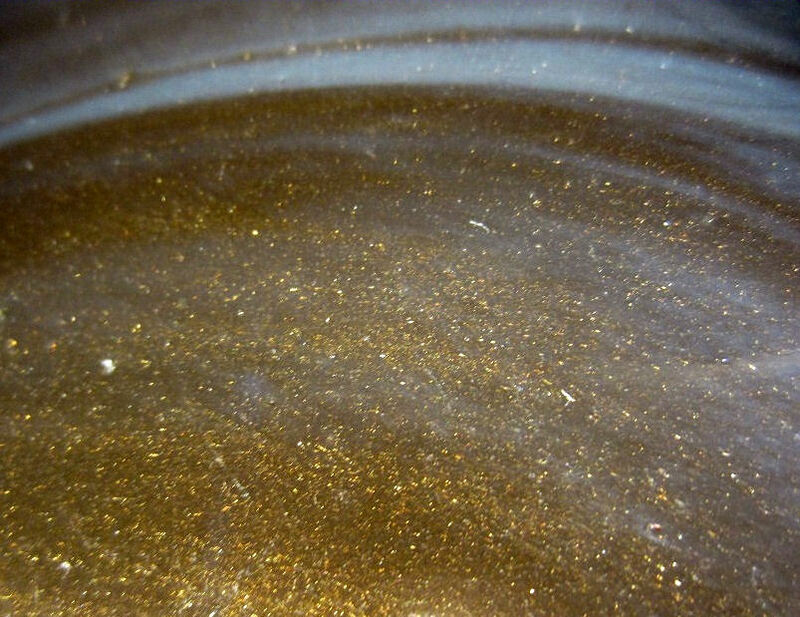 Obviously the interior of a furnace as it’s coated with once molten iron. 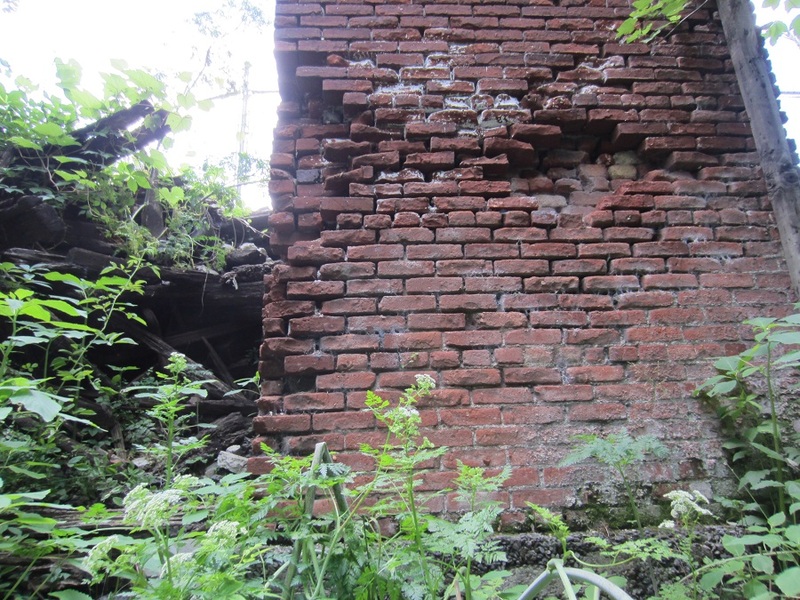 The iron based, normal red bricks like the one also sitting there were not suitable for the extreme heat (1000 degrees Celsius,) of an iron furnace and would have melted with the iron. Below the molten iron sheathed furnace section was a large piece of waste iron slag. In those mid to latter third 1800’s blasting furnaces along creeks, there could be 100 tons of iron produced, but, in most cases, 50 tons of it could be waste in the form of iron slag with the incorrect carbon mix. 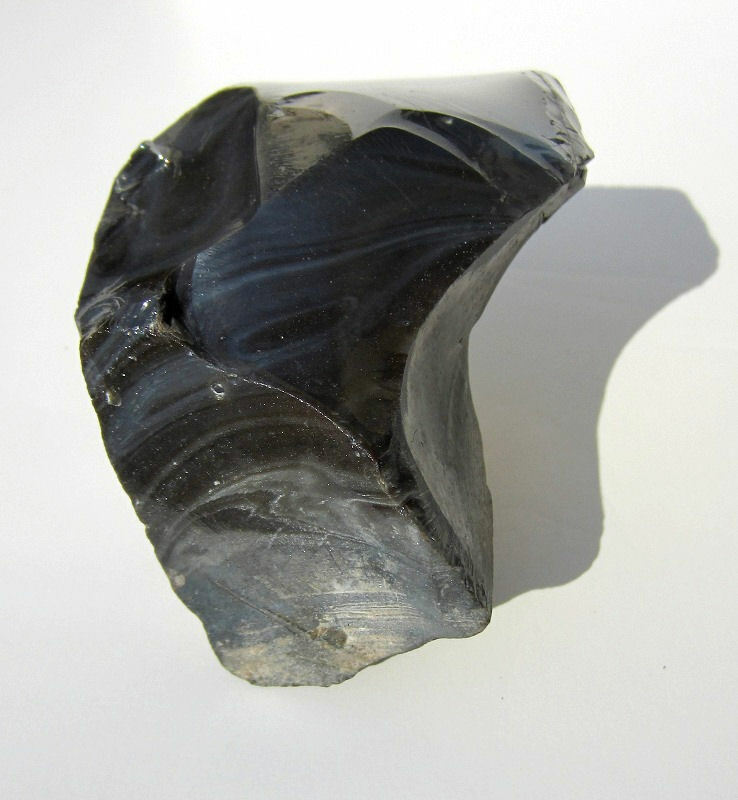 The remainder of waste resulted in some of the most beautiful melted silica based fieldstone rock which became glass. I didn’t know it at the time, but I was in for many surprises and quite some spectacular finds. Shown below is the above piece and another “Chocolate” coated firebrick cleaned up. These were old and very interesting. 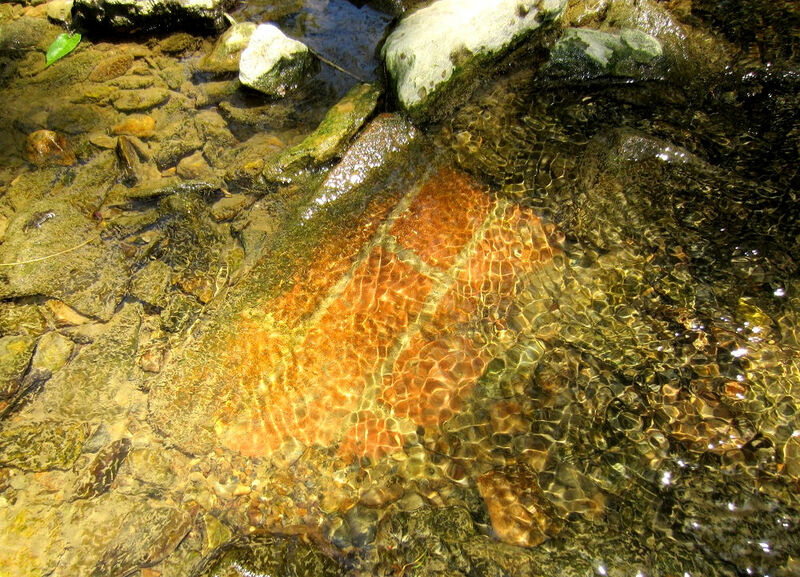 There was a fair amount of firebrick in this creek, but there were definitely other interesting finds and amazing beauty further upstream. Heading up further, I noticed a most beautiful shady spot for a break. There was no signs of any historical industry here. Very peaceful. Nature. Neither eight, nor forty-eight. You are ageless here. Van was right, I could have sat there all day. 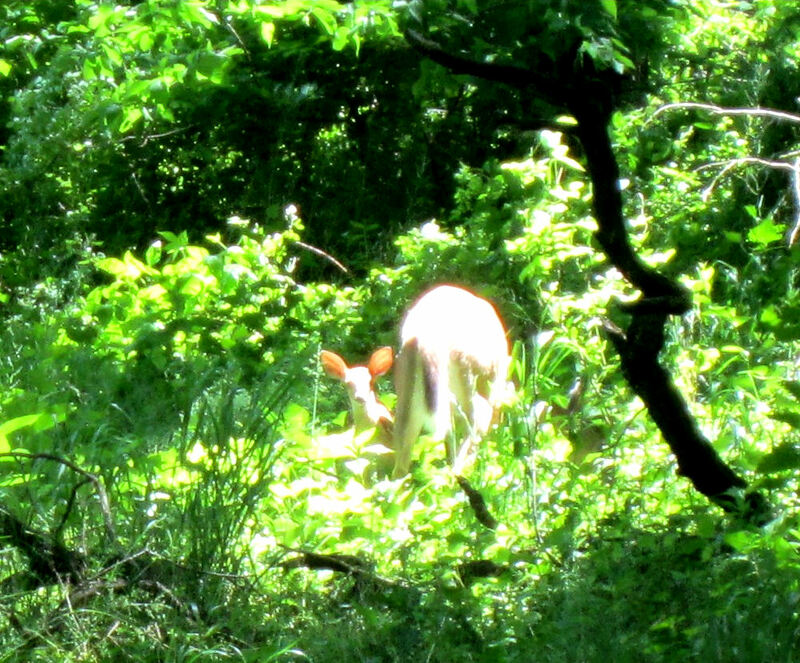 Moving on, I happened across a beautiful White Tailed Deer, a doe and her fawn, (the White Tailed Deer is Pennsylvania’s State Animal.) I love the first picture. The fawn has spotted me but the doe has not. 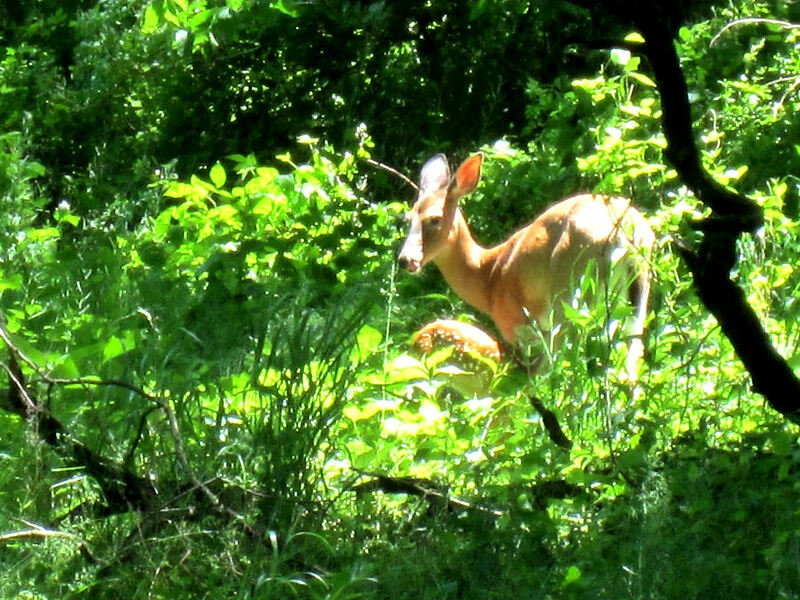 The fawn went back to eating and now the doe looked back warily, wondering what caught her little one’s attention. 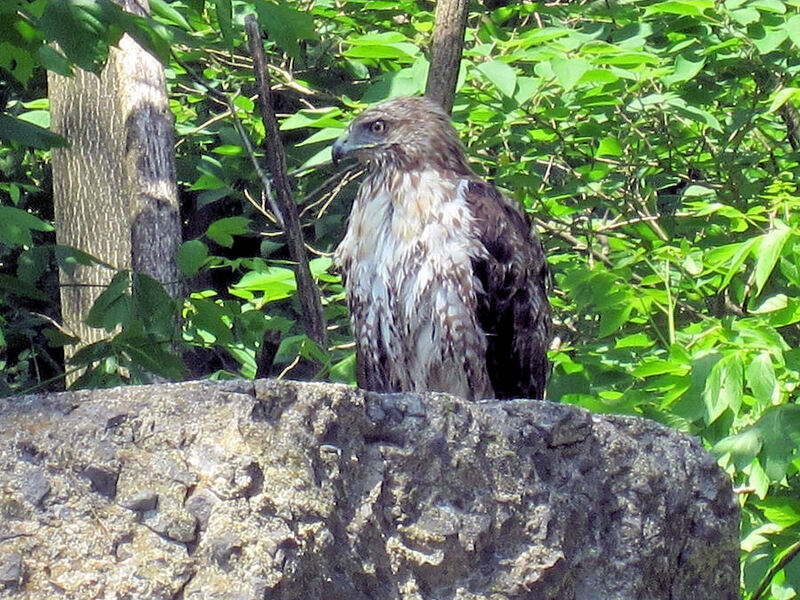 I met them later upstream in the creek but didn’t have my camera handy and they bolted into the woods. Some areas of the creek were too muddy to wade in my river wet/dry ‘Keens’ footwear and “dry in minutes” Gramicci river pants. (Long pants are a must due to poison ivy.) Walking through some growth on solid ground I couldn’t help but capture these beautiful flowers. 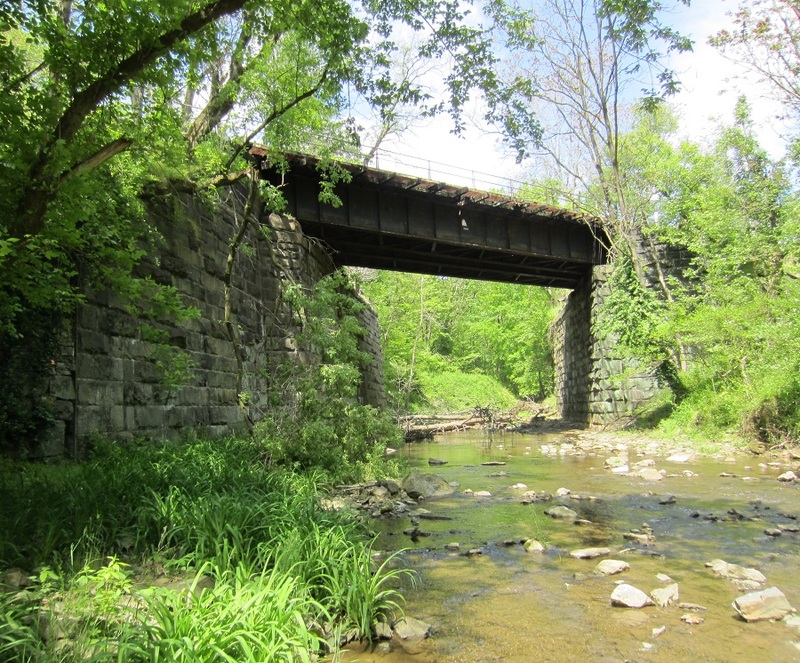 Having traversed back to an accessible way into the creek, I soon came upon this very old railroad bridge. The year it was built is not known to me. It’s still used for freight. I just loved the simple, yet sort of artsy look of this very solid bridge. The hand hewn large blocks have a most wonderful greenish patina, like aged copper or bronze. Climbing up the side and stepping up onto the tracks offered a very unique perspective. It reminded me of the late River Phoenix as a child in that movie, Stand By Me. It was also like looking through my own personal history. 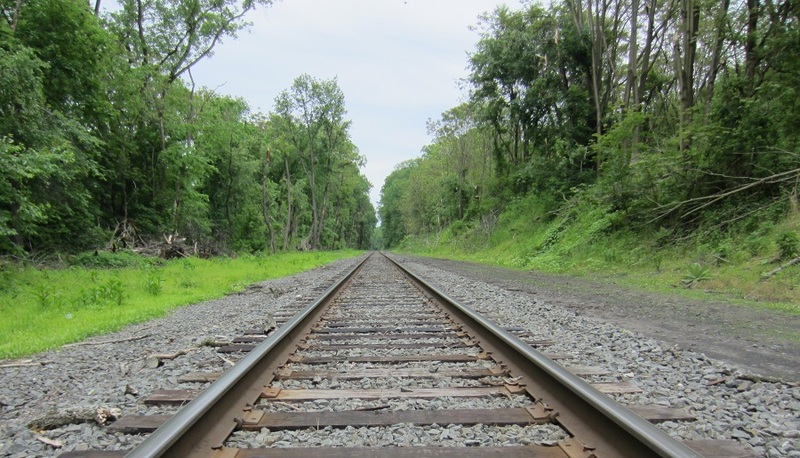 I used to walk the tracks as a kid along the Schuylkill River, in King of Prussia, not far from Philadelphia. I was really enjoying being eight years old again. No one should ever lose the wonder of discovering and learning. 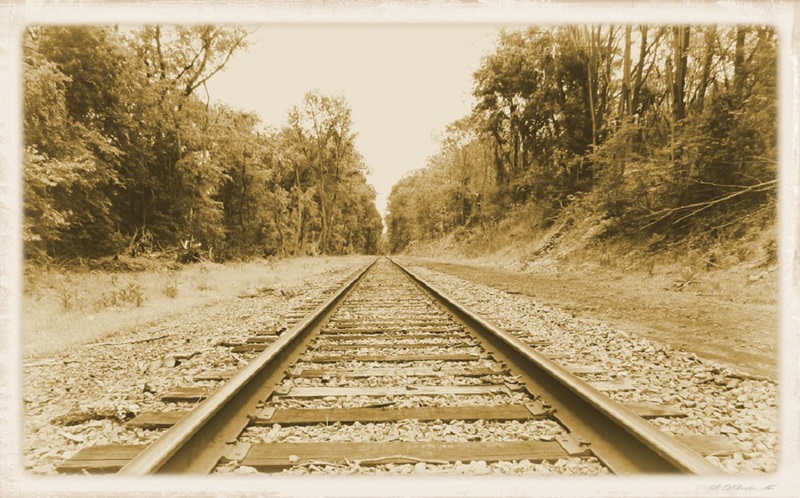 Staring down these tracks made me realize I’m still every age I ever was. This is facing northeast towards Lancaster. Below is how it would look in an 1800’s albumen style photograph. I want to walk to the infinity point and see what’s there and also see everything along the way. I wonder if symbolically that’s what we’re all here to do. Coming back down, I had no idea I would be taking home the Bronze Medal for railroad history for my creeking Olympics. On one side the bridge in a totally washed out area was a very unique object. What is that? Having camera in hand, I had yet to pick it up. 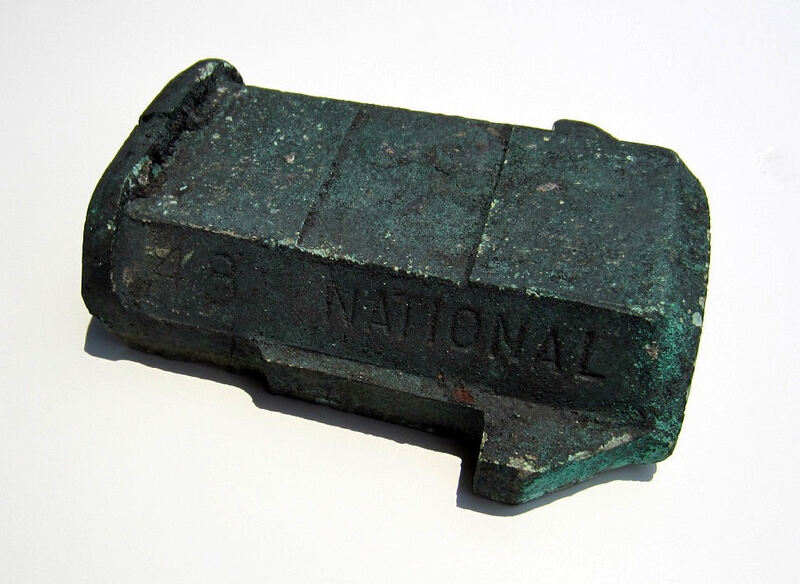 A very greenish metal piece with the words 48 NATIONAL on one side. The other side was signed AAR-D 5 x 9. I picked it up and it felt every bit of 25 pounds, not large enough to have so much weight. It measures about 9 inches and is 6-3/4″ at the widest flanges. The base was rounded like a sleeve and has lines across it, but not threads. 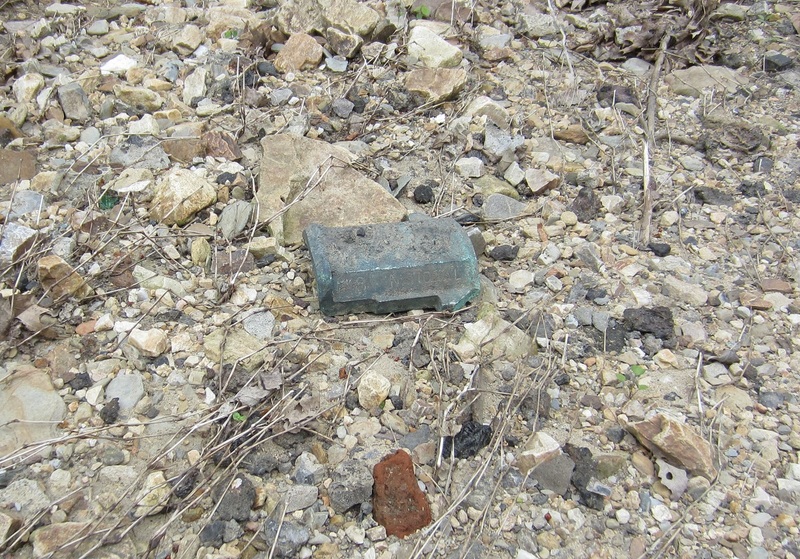 I noticed it had been in the ground for some time as it was encrusted with what appeared to be hard sand, rocks and bits of coal. Hauling this history mystery back to the car would be an endurance, as I didn’t have my backpack on this quick exploratory run. 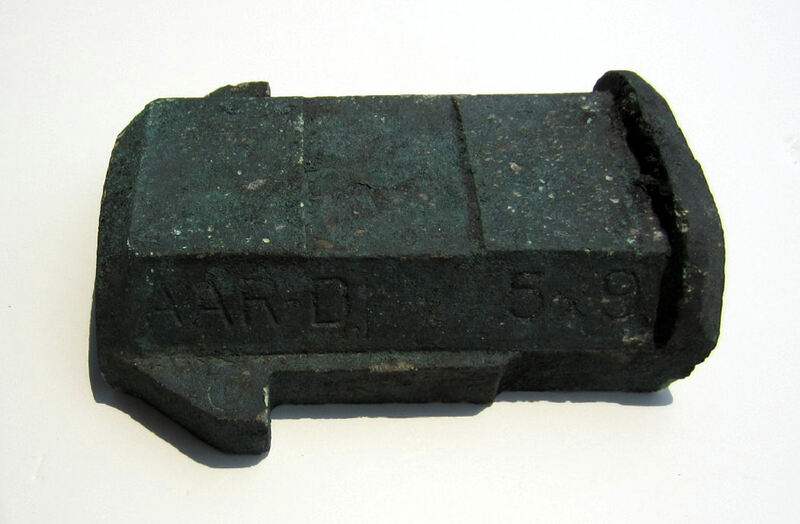 Turns out what I found was a solid bronze Friction Bearing from a National 48 (meaning 48 feet long) freight car. The AAR-D stands for the American Association of Railroads founded in 1934. The ‘D’ was code for 4 axles per truck. This solid bronze piece actually weighs 15.4 pounds. It’s very heavy for it’s size. Below are photographs of it cleaned up retaining the beautiful aged patina. I gently tapped the encrustations off and brushed it with a nylon brush. It’s quite the piece of a train, likely from the 1930’s to 1940’s. Noting the above picture, this underside of this old train part tells quite a story. A “Hotbox” had occurred. I worked on board Amtrak’s Autotrain and then their Tampa to New York trains (Silver Star and Silver Meteor,) in the latter 1980’s. Many times the train had to stop and it would sometimes take hours to replace or repair. This was due to a hotbox, a situation in which a bearing in the wheel truck assembly becomes overheated. Even though the solid friction bearing I found had ceased production by 1966, by 1972 all train bearings had to be replaced by roller bearings. Even roller bearings can get too hot. But, I imagine this problem occurred more frequently with the older style friction bearing. Note in the above inner lined sleeve of the bearing, the brown ‘melted on’ metal. The axle journal apparently melted to it. This was a cast off piece likely during a hotbox repair and replacement on or near this bridge. This piece was the top bearing in the Journal Box. Below shows a diagram in which it is easily recognizable. The lower section held padding (usually cotton,) and was full of oil. The axle heat was transferred to the top bearing which cooled it with the passing air. 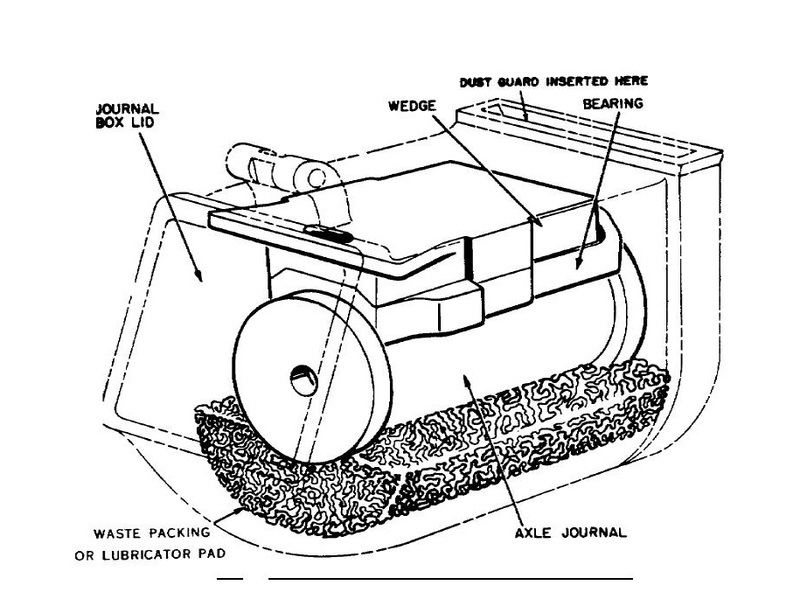 These solid friction bearings were very convenient for hobos in the 1930’s as they could easily open the journal box lid and take the oiled padding and get a nice campfire going. Who knows, maybe that’s what happened to the one I found, ‘Boxcar Somebody’ could had taken all the oiled padding. Unanswered questions left to the imagination are as much fun as the answers when found. These first two creeks are just the prologue. It had to be this way. I had to make my bones before exploring the best creek of all. 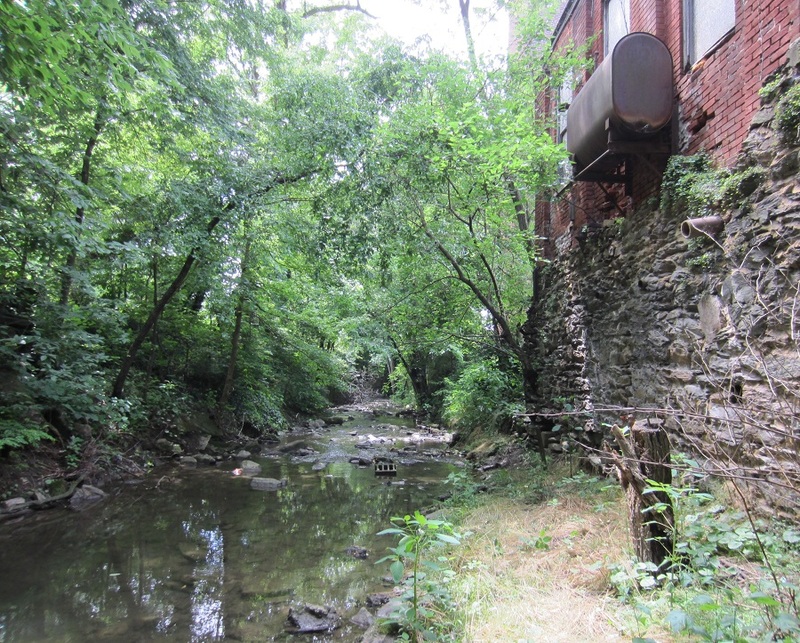 This creek runs through the eastern side of Columbia, Pa. I knew it was there, but it was a matter of determining an access point. 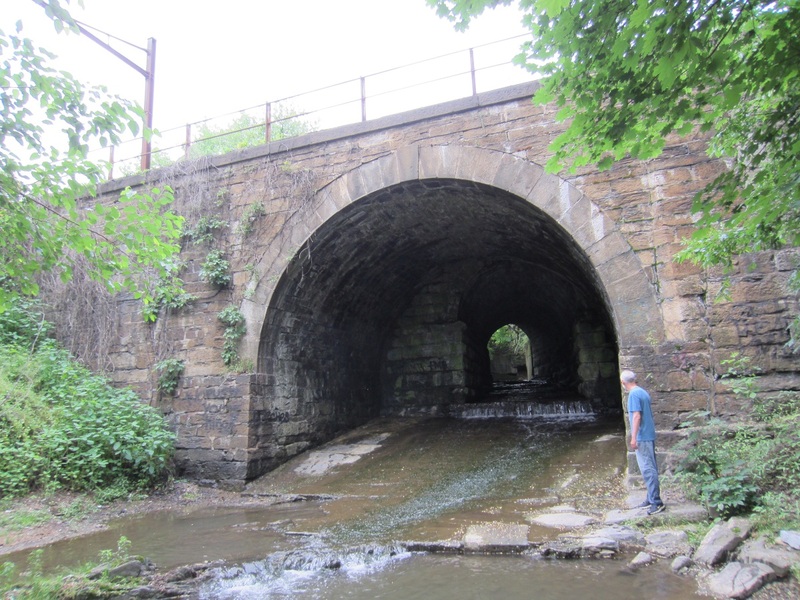 Finding a vacant lot in which an old saw mill once existed in the 1870’s, I parked and walked down a path to find a beautiful and very old railroad bridge just east of my entrance access. 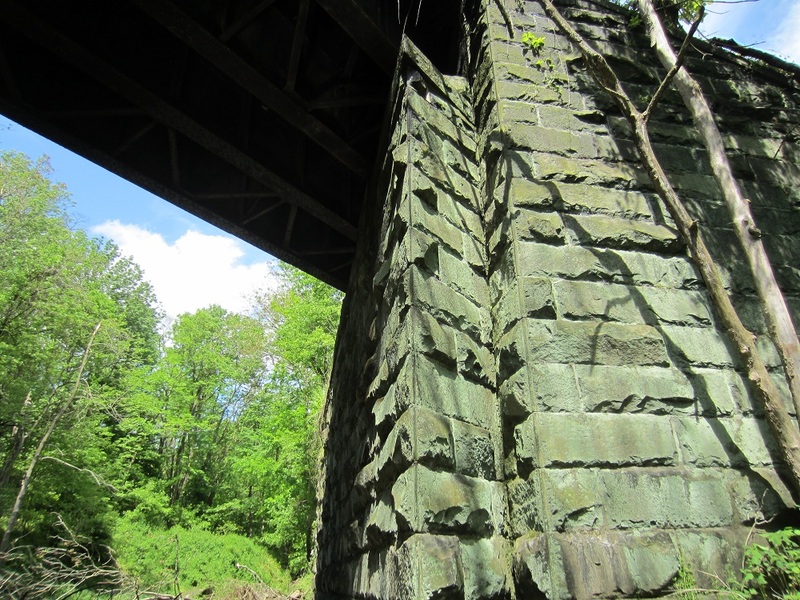 Not only was this a very old Reading & Columbia railroad bridge, it was the most unusual one I’ve ever seen. The whole design was unique. The base of the bridge was also hand hewn and laid stone, resulting in a cascade of beautiful, primitive stair steps to traverse to the creek on the other end. Below shows the entrance and inside. Very interesting and solid architecture. Note the size compared to my friend Dave standing there. 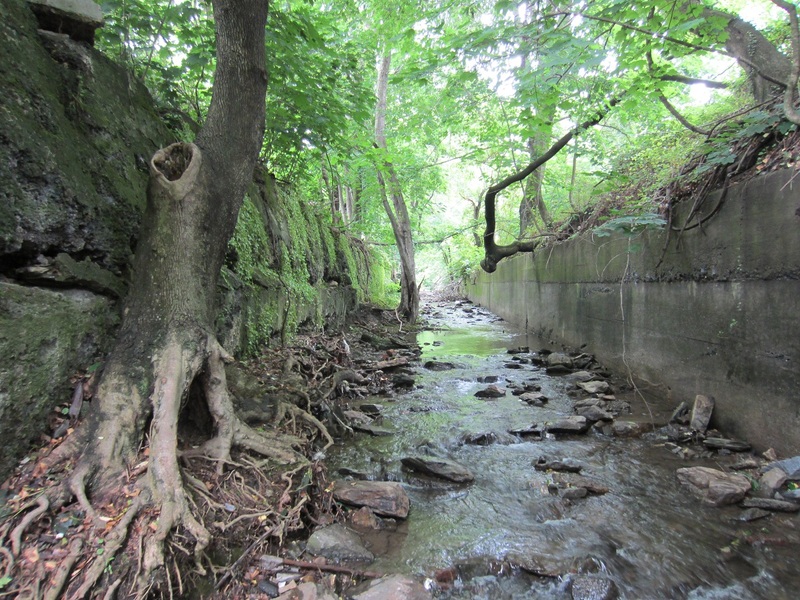 This was the entrance to the most amazing creek so full of industrial history it was mind boggling. Let’s continue the journey and walk under this intriguing bridge. Kick back and be comfortable, Dave and I will get our feet wet for you. The cool cascading water felt great on our feet on a hot day. The base stones were mossy, but not treacherously slippery. It was wise to stay along a wall and have a hold onto the stone as you went. Going in with a backpack with only small digging tools and drinking water wasn’t difficult. Coming out with several relays of 30-40 pounds of artifacts was a tad trickier. Upon coming out the opposite side of this really cool old bridge, there was a sharp bend, then a straightaway. 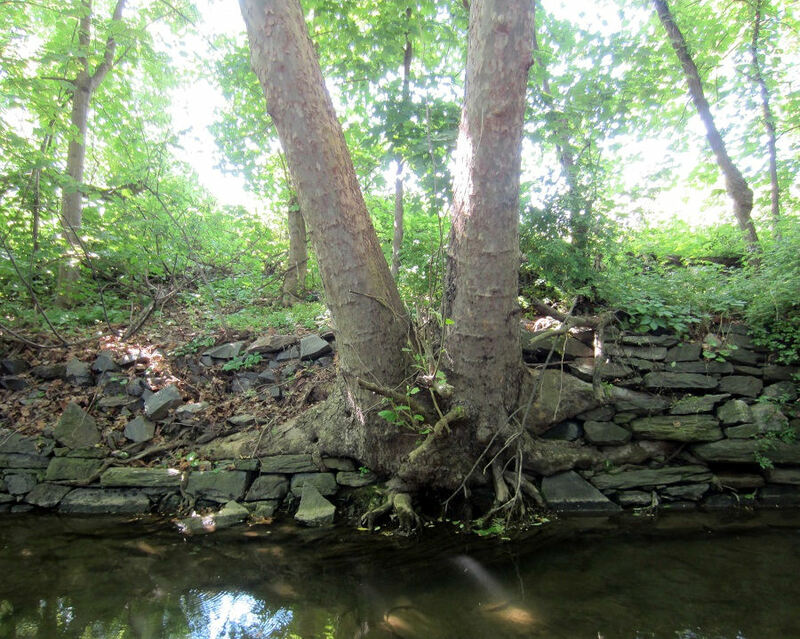 The walls of this area of the creek were concreted a very long time ago. We had to hug the inner bend immediately after the bridge and walk on stones in foot deep water as the other side of the bend dropped to a 4 foot deep pool. Having rounded the bend, below is what we saw. 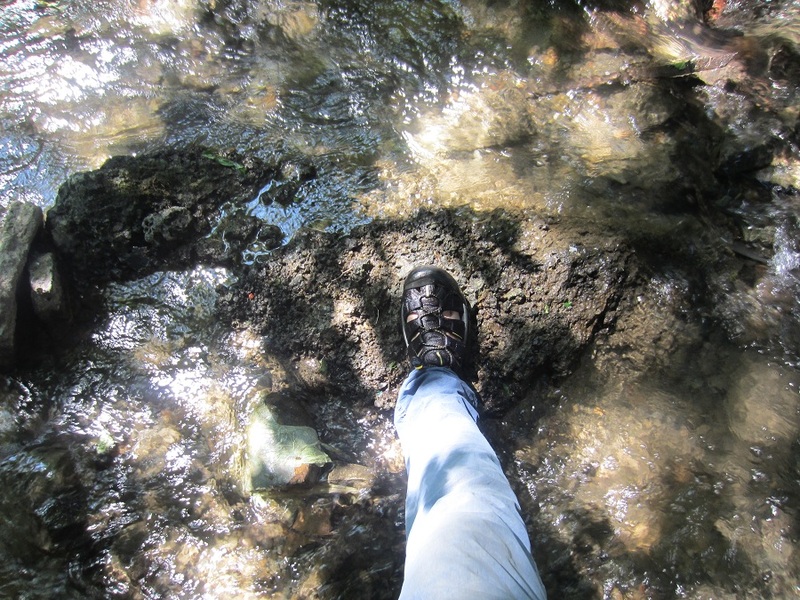 This creek, being in town, was very different than the previous two we investigated. 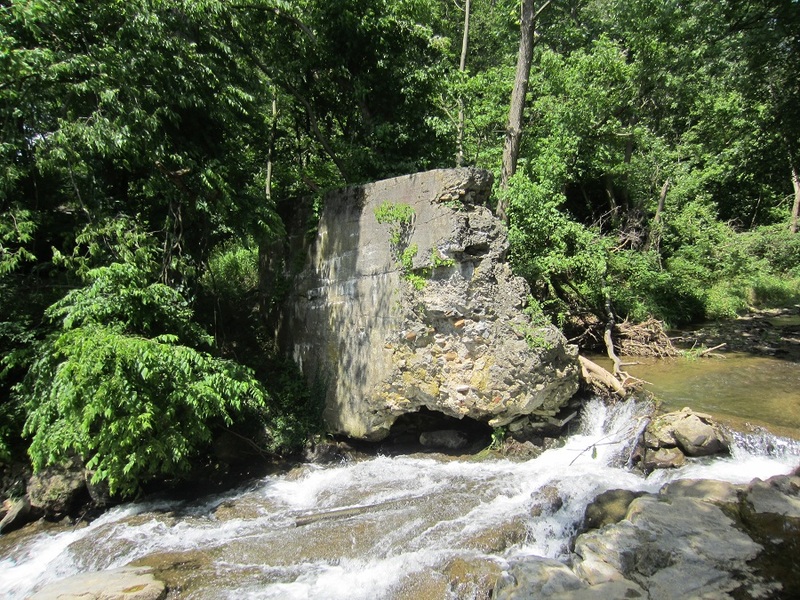 The old concrete wall to the right and the sloppily poured concrete on the left channeled the creek, but didn’t stop artifacts from the 1844 Shawnee Blast Furnace further upstream from showing up and actually coming out of the ground below the walls. 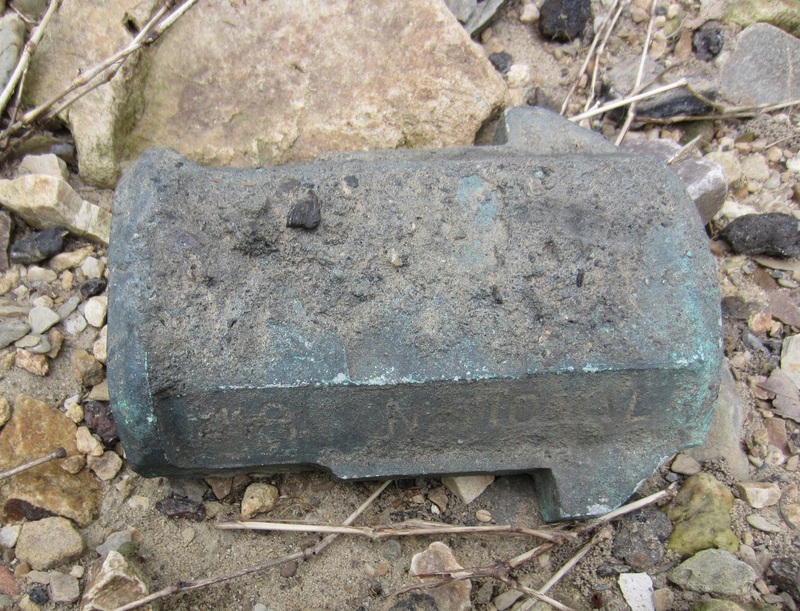 We discovered that the majority of the old iron blast furnace parts and artifacts were in the ground as far as 6 to 10 feet below current top ground surface. 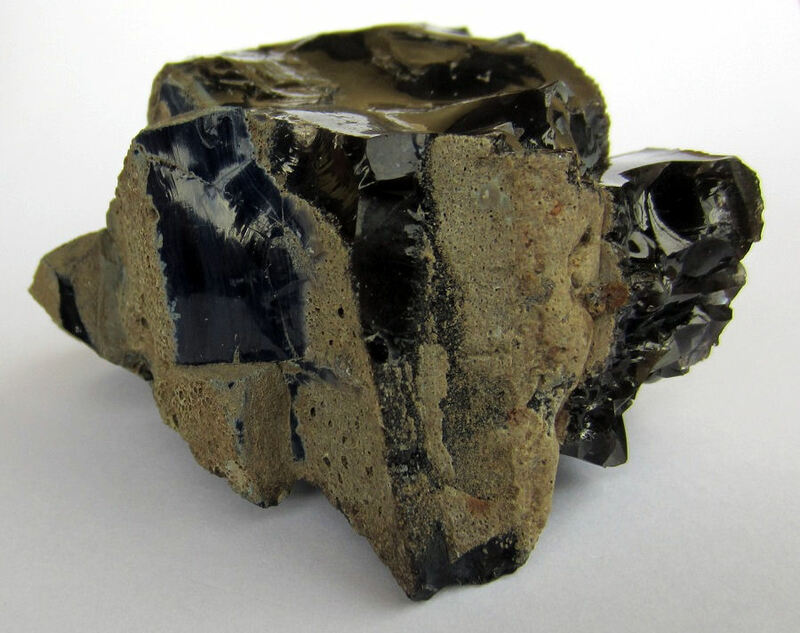 A closer look shows that there is almost more iron slag and firebrick and industrial artifacts from the furnace than natural rocks and stones. Below shows a pile I made of interesting items I made gathering from a five square foot area just for a sample photograph. 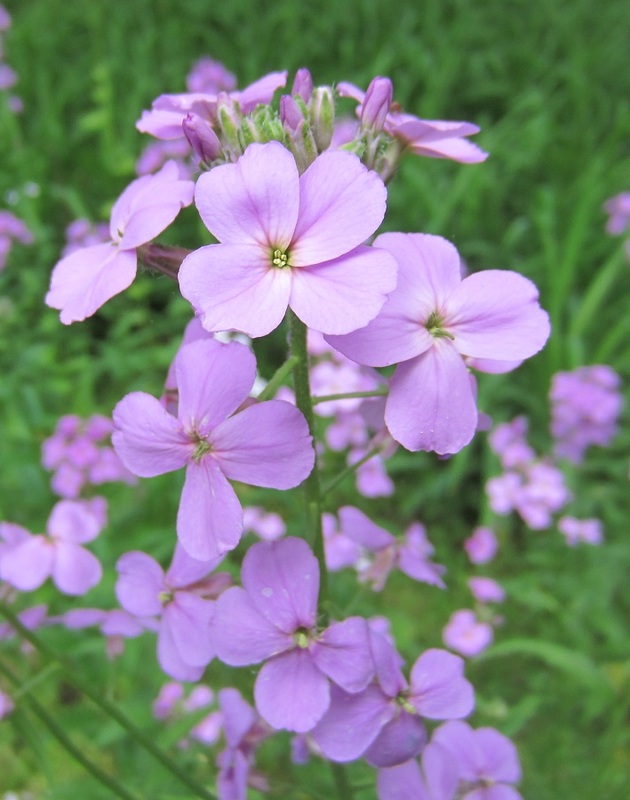 It became apparent that the 1800’s workers at the furnace dumped waste and refuse downstream. 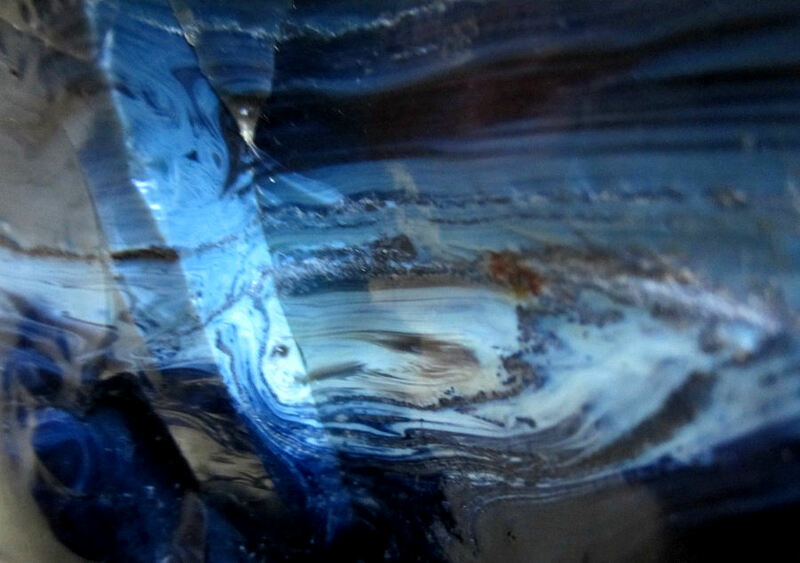 From chunks of slag iron and firebricks coated with once molten iron, to a piece of slag melted stone turned to glass featuring sky blue color, there was a lot to choose from. Walking just a short ways up I noticed a very large piece of iron slag, below is a photograph of it with my size 11 ‘Keens’ wet/dry shoe for comparison. 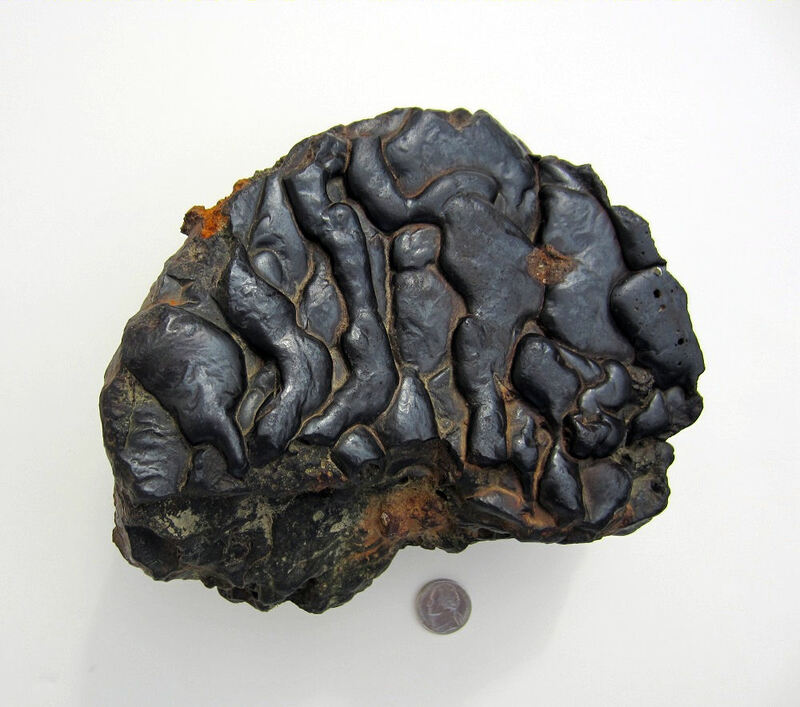 Most iron slag was very unattractive as this example shows, but there were some rare fascinating once molten surface examples I recovered that are very artsy. Continuing further along this concrete channeled ‘alley,’ the wall ends and there is an interesting fieldstone based building topped with old 1800’s brick. At first, I thought this could have been the furnace I was finding the artifacts and debris from, but, due to an 1875 map I studied in the State Library, this was not to be the case, this building was not on the map and possibly postdated it. 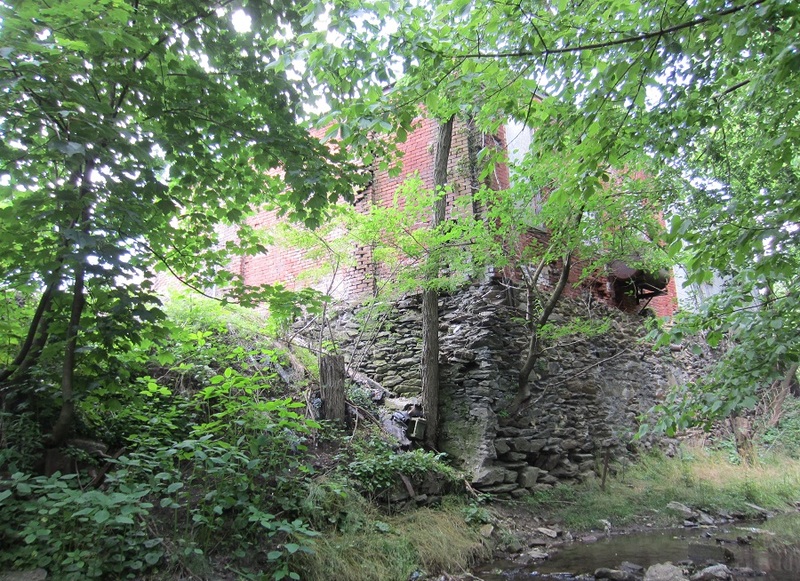 The Shawnee Iron Blast Furnace was established in 1844 and was joined by the Chestnut Hill Iron Ore Company addition in 1851 and operated until 1894. 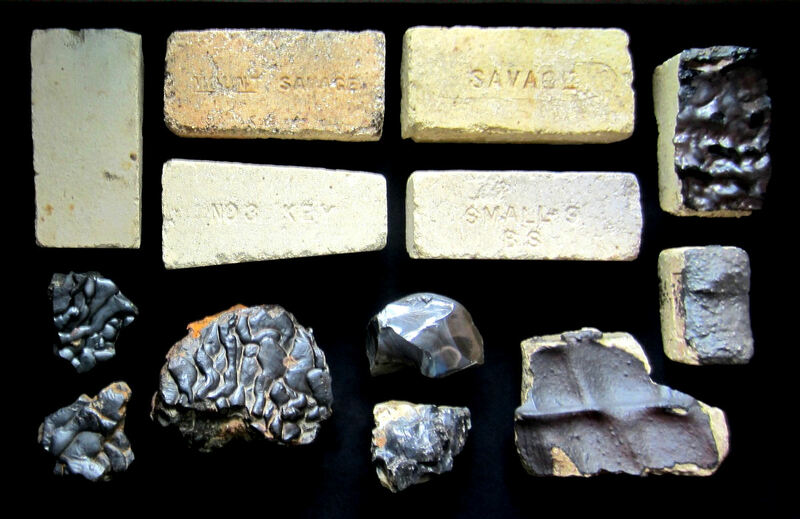 All of the artifacts and industrial objects I recovered dated to this era. 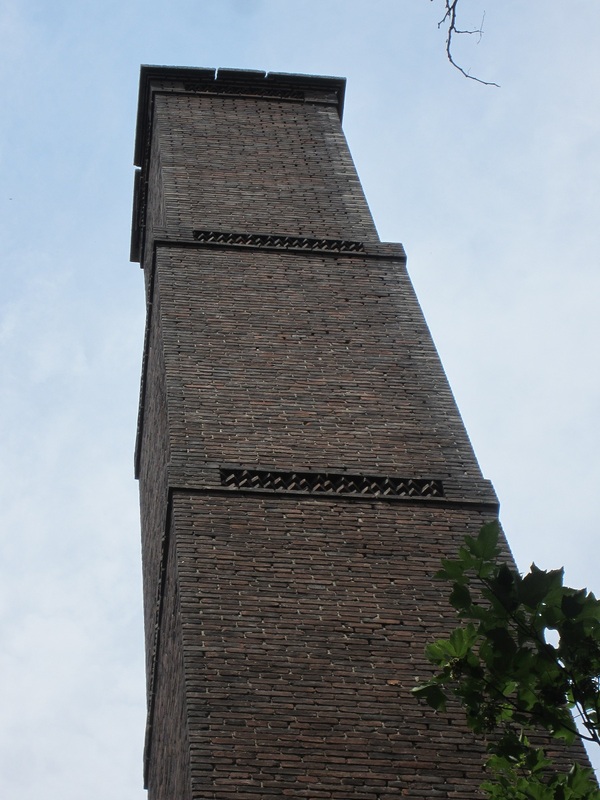 The fieldstone base brick building shown below was accompanied by a most aesthetic square smokestack I’ve ever seen. It was at least 100 feet high and and every lesser width section going up it is decorated by carefully placed pointed bricks layered outward creating a decorative look more than just industrial. Below is the building. Just to the left of the above photograph is the smokestack. I cannot identify this building, yet there is a front addition that a current day business occupies. 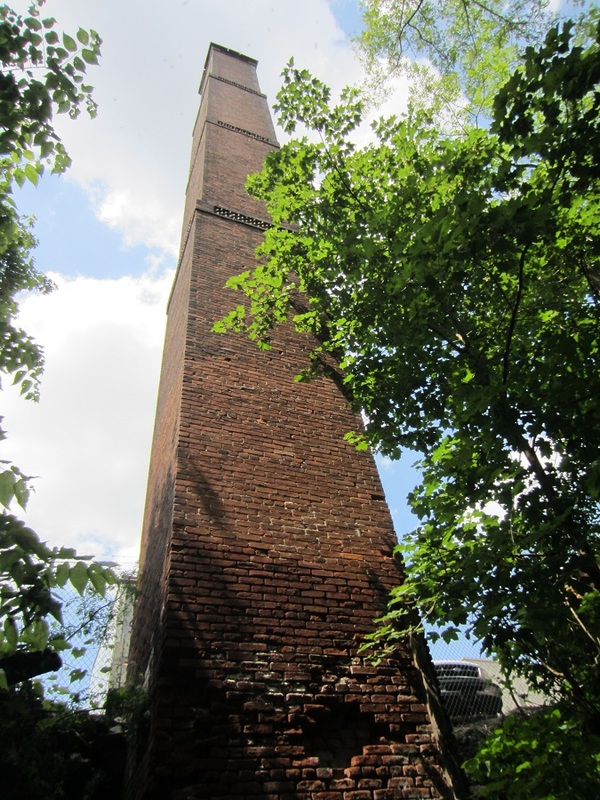 Below is the smokestack looking up. The style as the height increases is very interesting, see below zoom for details. 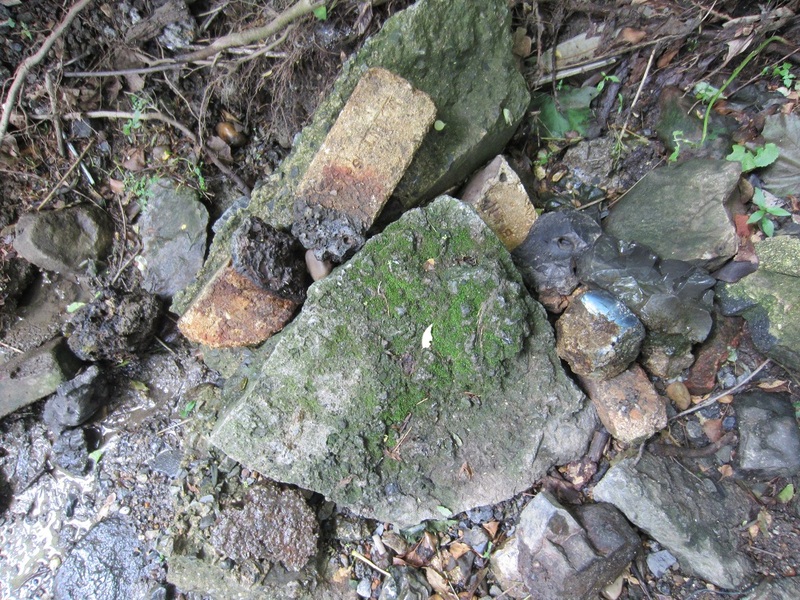 The base shows clear evidence of past flood erosion as seen below. On the right face at the base is a bricked up arch. On the left side as you can see above is room to make my way up the bank to see what was on that side. 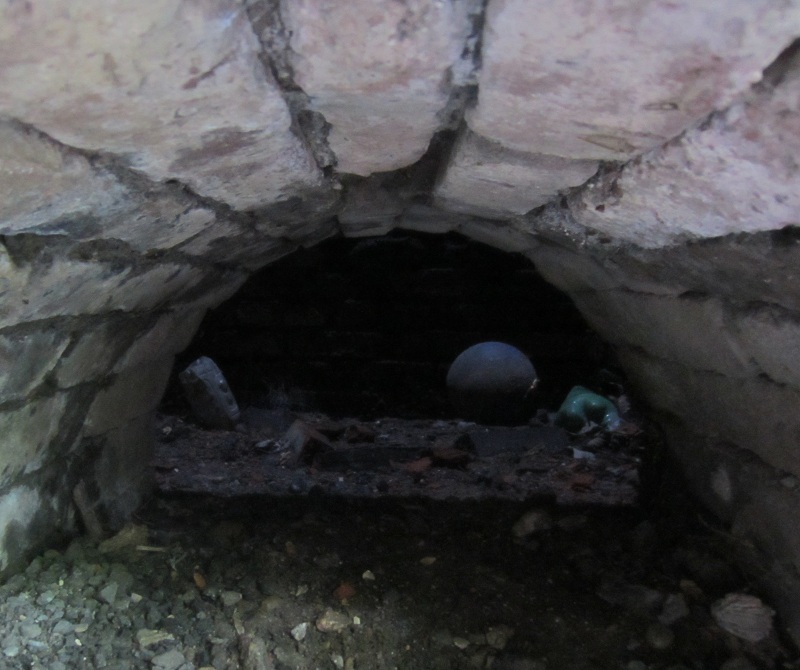 There was a small arched opening like a tunnel on the left side the base of the stack. The opening as I approached it, carefully eluding poison ivy. A look inside without a flash shot, the shaft of light from so far above showed, wait, what? A cannonball? It just couldn’t be. Now I was eight years old again and very excited. But, how to get it without getting stuck and changing my name to ‘Timmie’ and hoping Lassie would come to the rescue? Looking about, I hopped back down to the creek and saw the perfect long stick with a elbowed end. Back up I went with it. Poking it in I discovered what ironically was exactly what I had when I was eight years old. 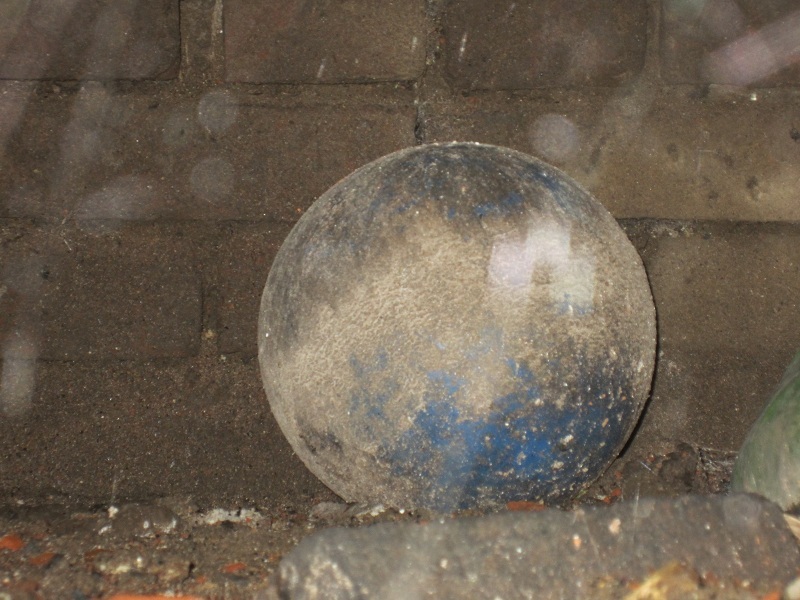 A plastic blue ball, only this was so covered with grime it appeared to be iron. How many years has this been in there? If I had zoomed my camera first off and taken the above flash picture, I would have realized this, but a tad of excitement had me overlooking that logical decision. I had to laugh walking back to the creek and continued upstream. Looking at the opposite bank of the walled creek across from the old fieldstone and brick building, I noticed a very interesting carved socket under water. Possibly a fitting for a long ago water wheel for natural power? I am unable to identify what this was used for, see below center of photograph under water. This building with its well built brick smokestack was not the furnace I was looking for. Just past this building a little bit further was an old dump coming out of the bank. 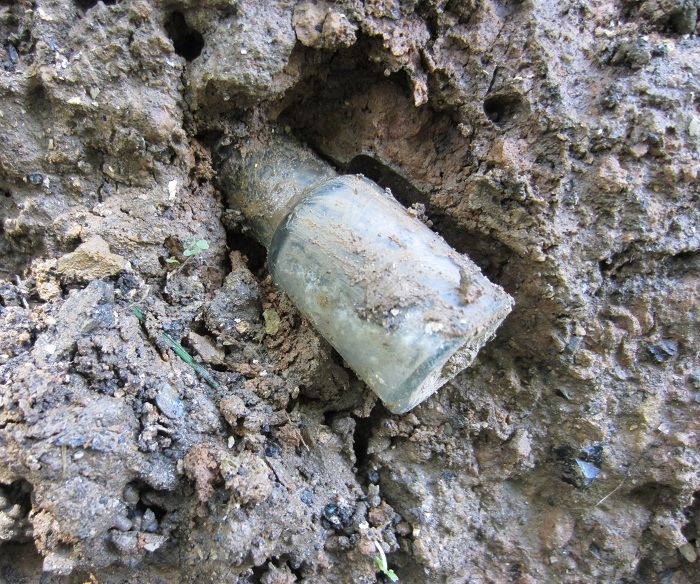 On my first visit up this creek, I pulled out an exposed half of an 1800’s white porcelain doorknob. 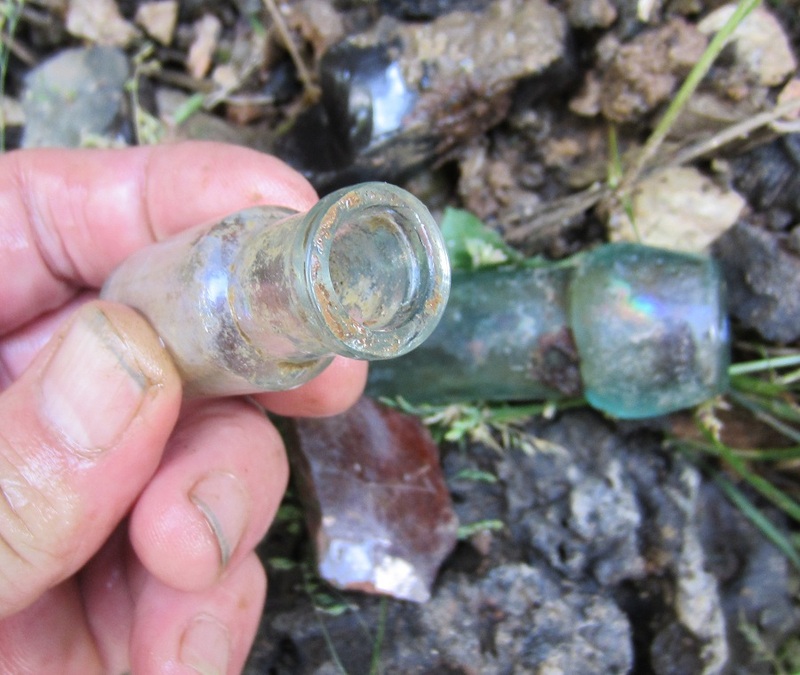 There were blob top 1800’s bottle fragments, complete neck and tops, but I did manage to find this little circa 1890 cutie of a bottle plainly visible after a good rain had exposed it on a later trip. This is a very small bottle, mold blown with a very sloppy tooled top. I rinsed it off in the creek. This is a finicky dump. Whenever I dig it or till it out with a 3 prong garden rake, I don’t find anything. It’s only when I go back after a rainfall and water level is back down, then something shows itself. So, I have no choice but to play by its rules. Venturing further upstream the creek undergoes a series of changes, from deep pools under bridges to shallow rapids which still had quite a mixture of all kinds of remains from Swawnee Furnace dating 1844 to 1894. 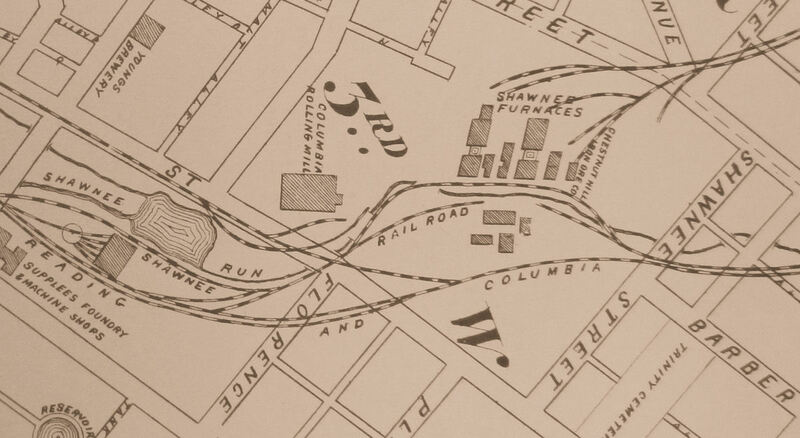 On an 1875 map of Columbia, the furnace and railroads all leading to it, and the creek itself, are all clearly apparent. The area around Shawnee Furnace was very interesting. The creek was walled. Built by hand a very long time ago and done painstakingly well with each stone fittting like a piece in a puzzle. It still stands firm. 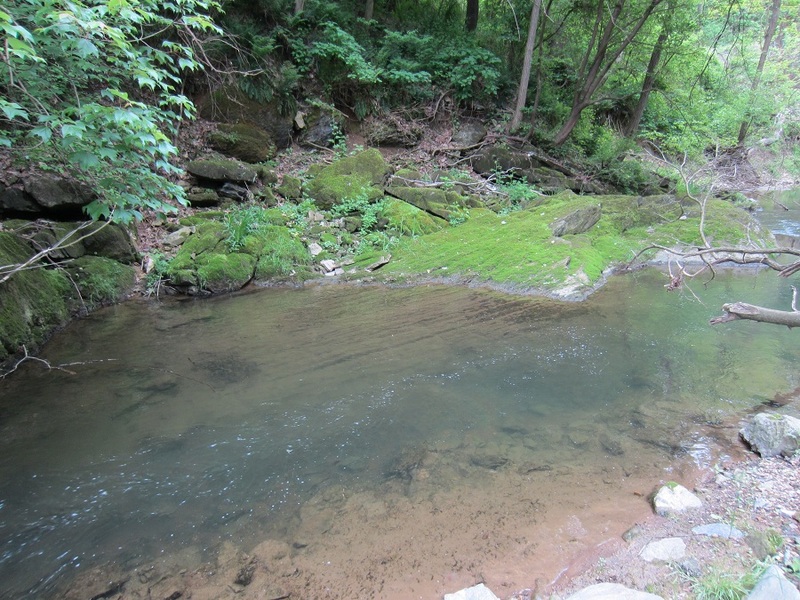 This creek got its name due to the Shawnee Indians that lived along it long before any other Indians were here. It’s all overgrown now, yet the wall didn’t stop this ‘Twins’ tree from growing out over time. The artifacts recovered are hard to describe with words. As mentioned in the beginning, some things are interesting because they have a name on them. What is so interesting are the artifacts that don’t have a name, yet when you look at them a name instantly occurs. These items are in a class by themselves and each are unique and, most wonderfully, are very old and have a traceable history. I recovered so many items, I couldn’t even begin to show everything I found. Below is a small grouping of examples of each, the named and the unnamed. 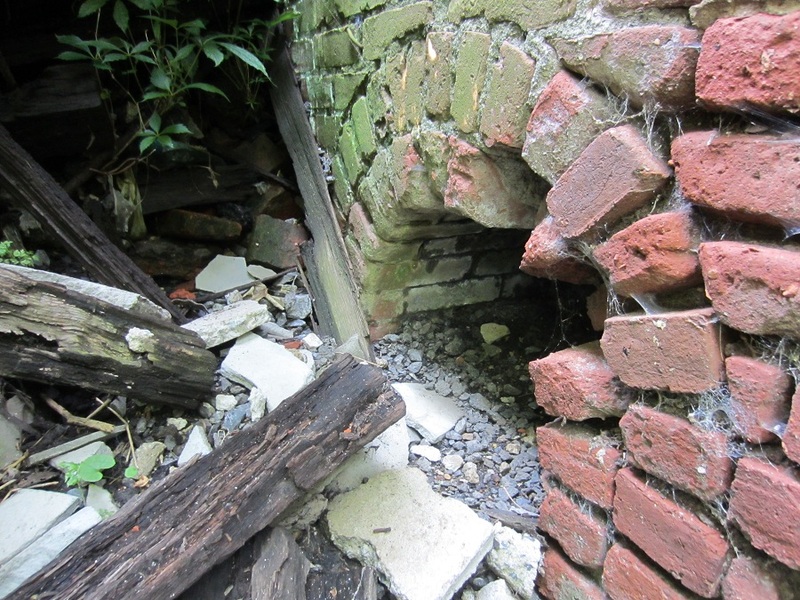 This is just an example of what one can expect to see from what’s left of an 1844-1894 Blast Iron Furnace. 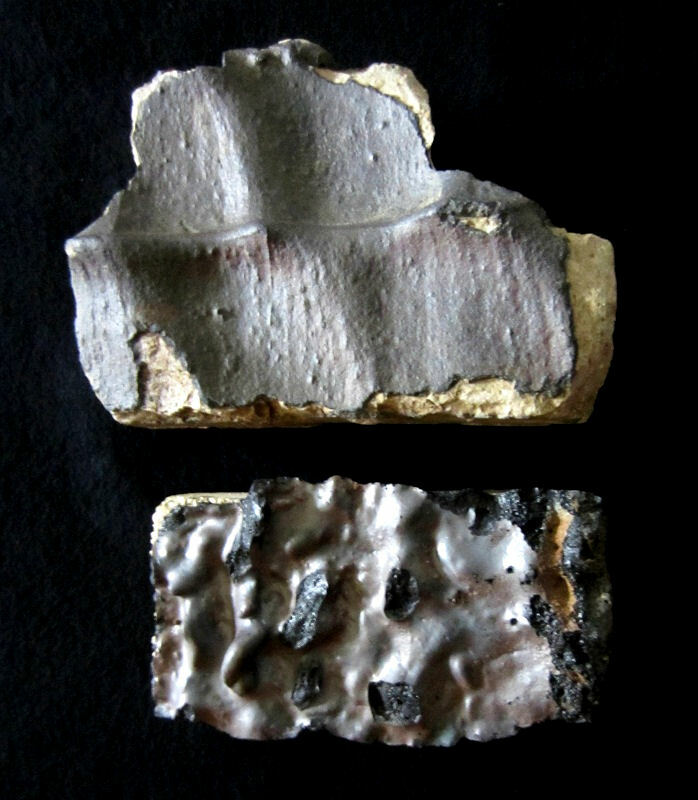 Below the aluminum based silica firebricks are three fragments of once molten iron. The center large piece weighs eight pounds exactly. The symmetrical patterns are like inkblot tests, you can see whatever is apparent to you in these pieces. 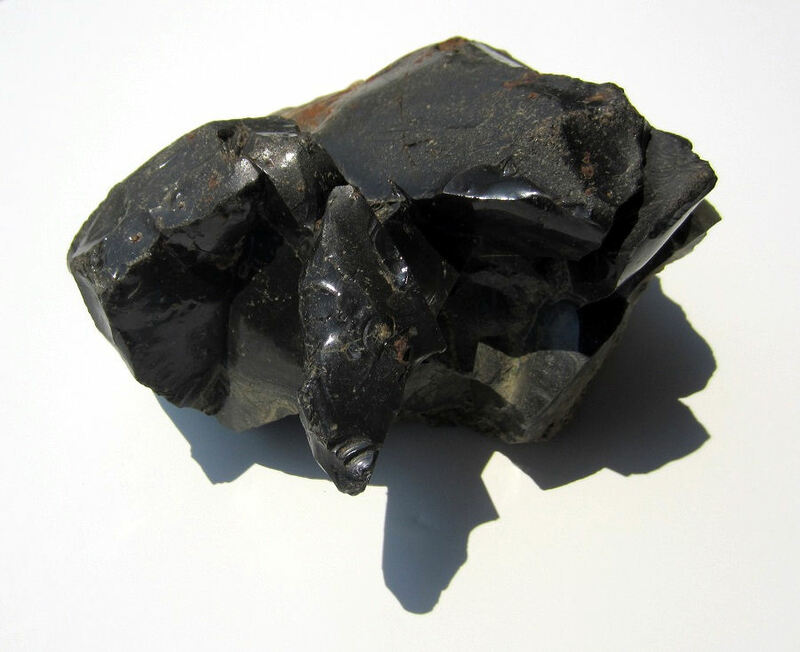 In the middle are two fragments of silica based stone melted to glass as a by product of iron making. Some of these pieces have such character and beauty it boggles the mind. Let’s begin with a look at a large once molten surface iron piece which is very difficult to find, especially in this size. Above shows the top in a white surface and the base on wood. 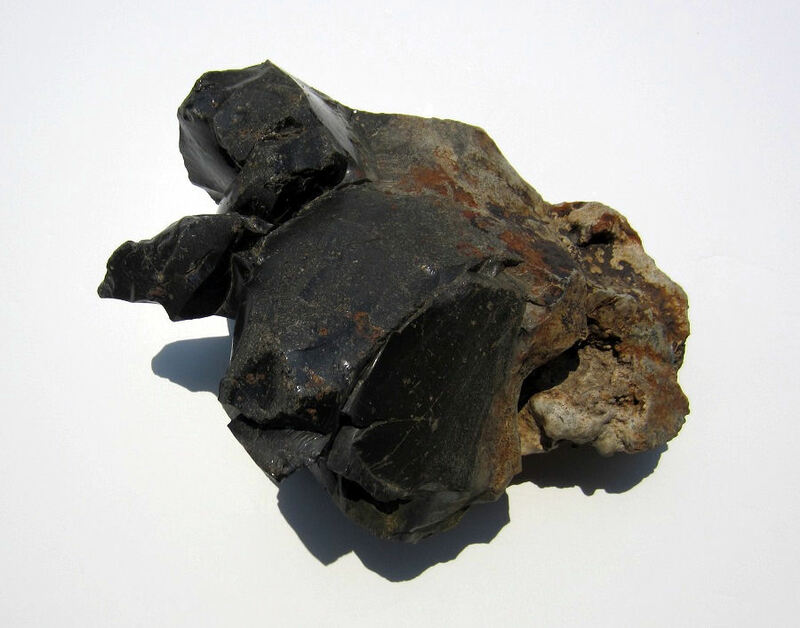 Below is a grouping of the three biggest fragments found and note the piece in the upper left, it has a pewter or silver tone and there’s clearly what resembles a leg in it. The top of the leg is near the nickel used for size comparison. This 19 pound large piece of iron has a red leathery top to it. I instantly saw this T. Rex fossil skull and lifted it out, wrapped it, and into the already heavy backpack and home it went. It has great character and I found the perfect spot to get it on where all the colors match. 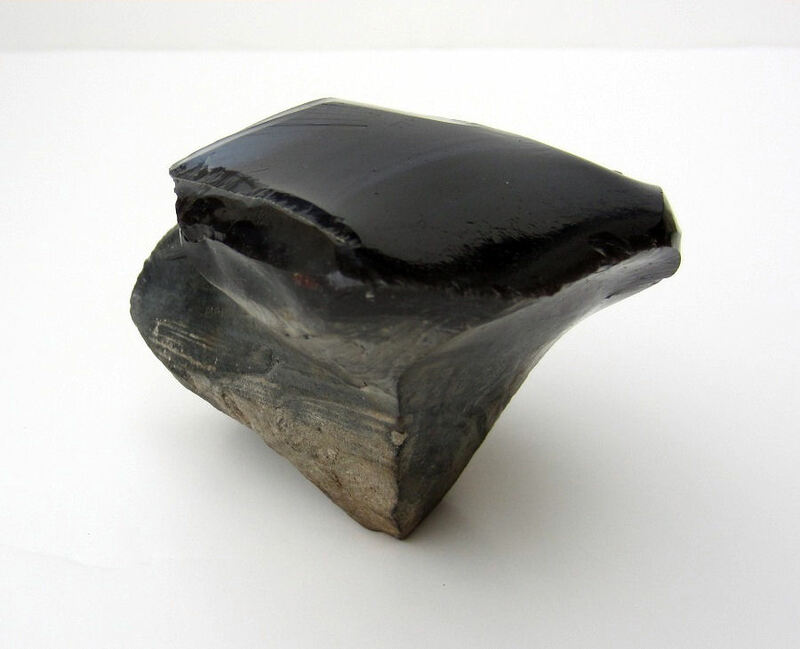 This very large and heavy 12.6 pound piece of stone melted to glass is quite the piece. It’s 10″ long by 7-1/2″ wide by 5″ high. Colors range from a dark jade green to blue to black. 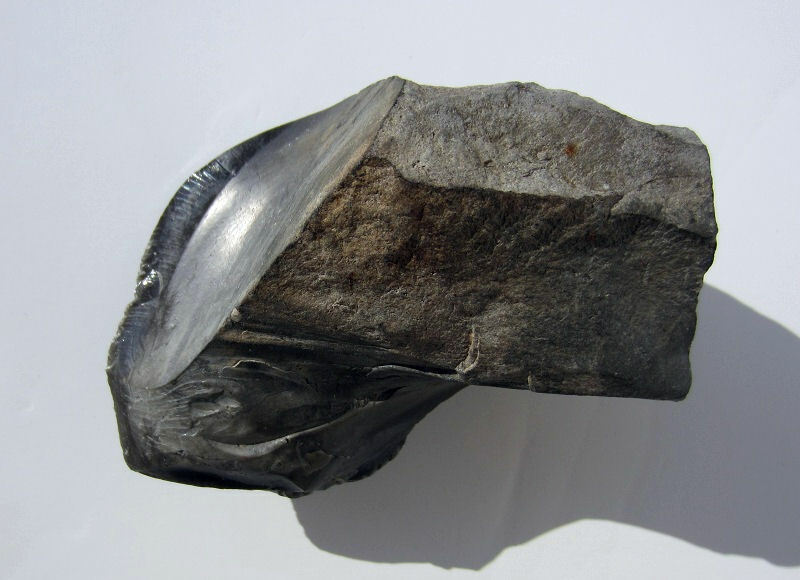 This Pterodactyl emerging from, or, frozen in a state of ‘becoming’ from stone to glass is a piece of art that has no name on it, but what else could it be? I chose to photograph it in natural light and then direct sunlight on white to show angles and shape. From sandy brown stone to green to blue glass, this looks different depending on where it sits. 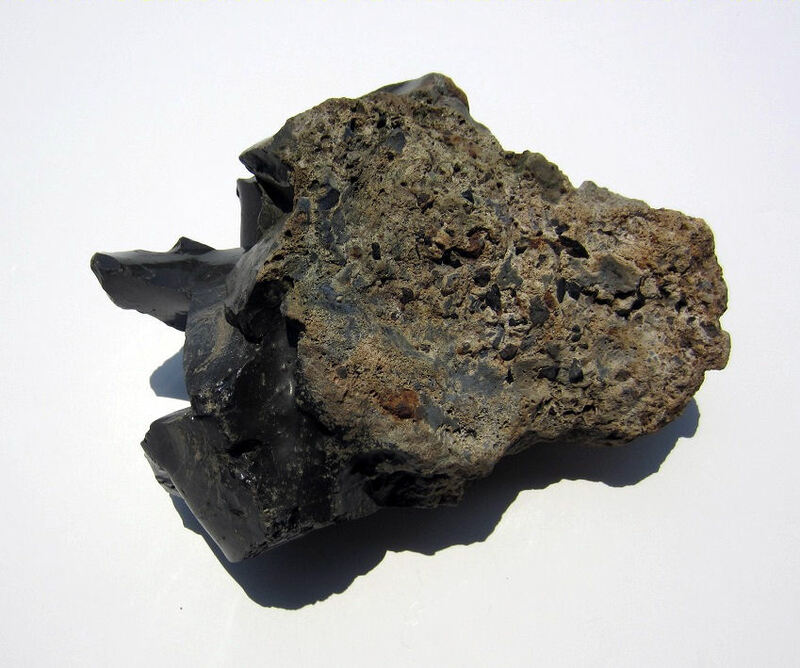 This was instantly noticed at the base of a bank that turned out to have many examples of blast furnace glass byproduct that was known for what it was then and dumped accordingly downstream from the furnace. The intense royal blue ‘Eye’ caught my eye and stopped me in my tracks. This not so little gem is 3-1/4″ long by 2-1/2″ overall. I can almost close my tiny fist over it. 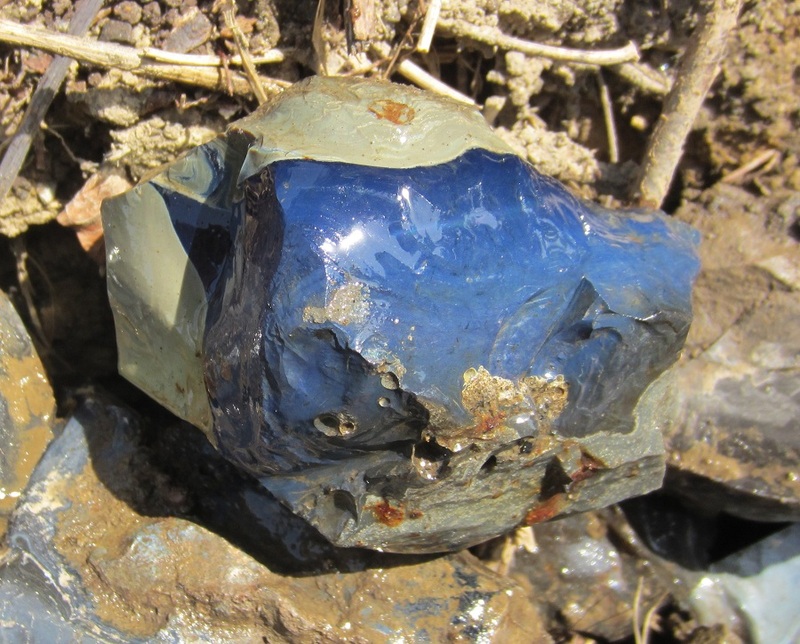 Shown below, as it was found, while I was making a pile, you can see the distinct line where bright blue glass changes to gray. Call me Ishmael. Or whatever you may, but this piece, to me, resembles a whale. The colors ranging from deep navy blue to cobalt, to sky blue and to white and black are astounding. 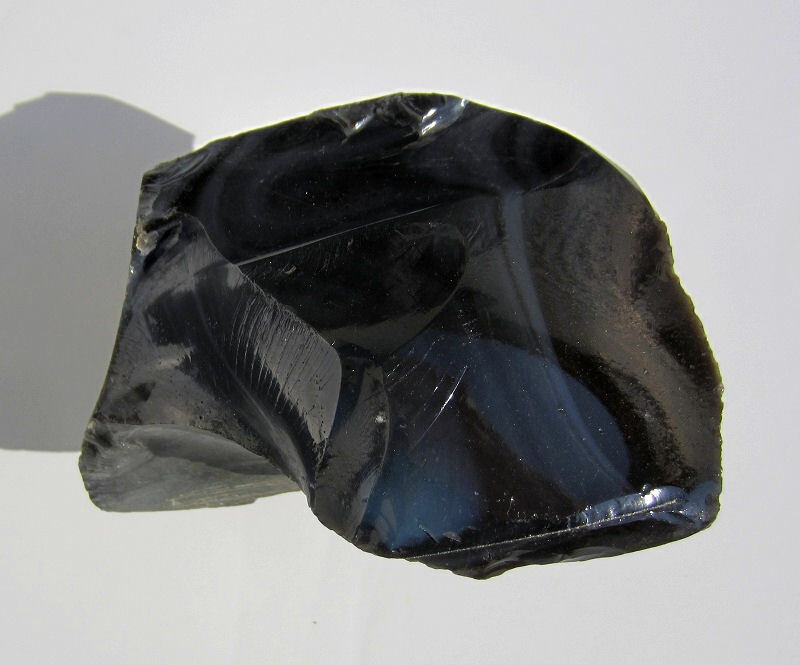 This piece has properties consisting of 95% pure glass and on the back, two patches of once molten iron. Upon closer inspection, there is more than just a whale going on here. 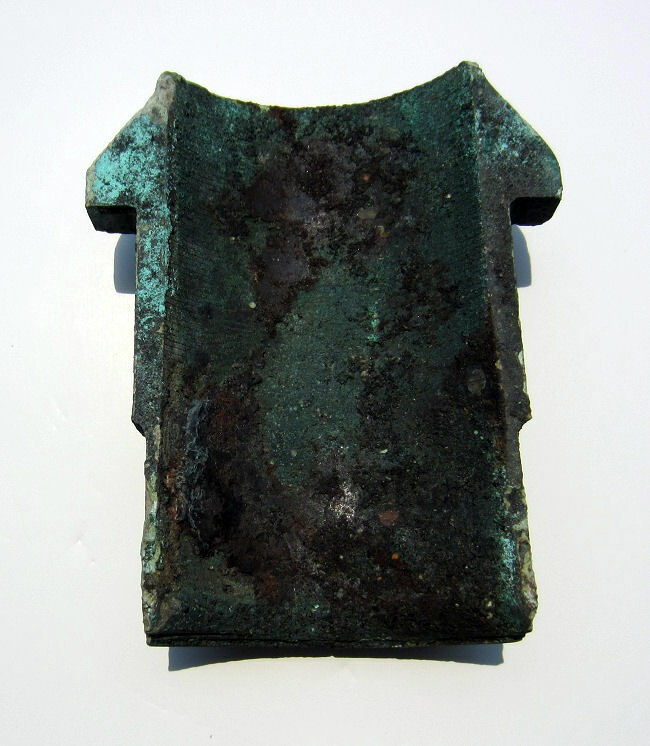 This is a good size piece and weighs 3.2 pounds and is 6″ long by 4″ wide by 3″ high. I’ll just let the picture paint the 1000 words. A closer look at what appears to be a stretched cartoonish face of a kid with a buzz style haircut. Incredible art to me, and purely unintentional of course. 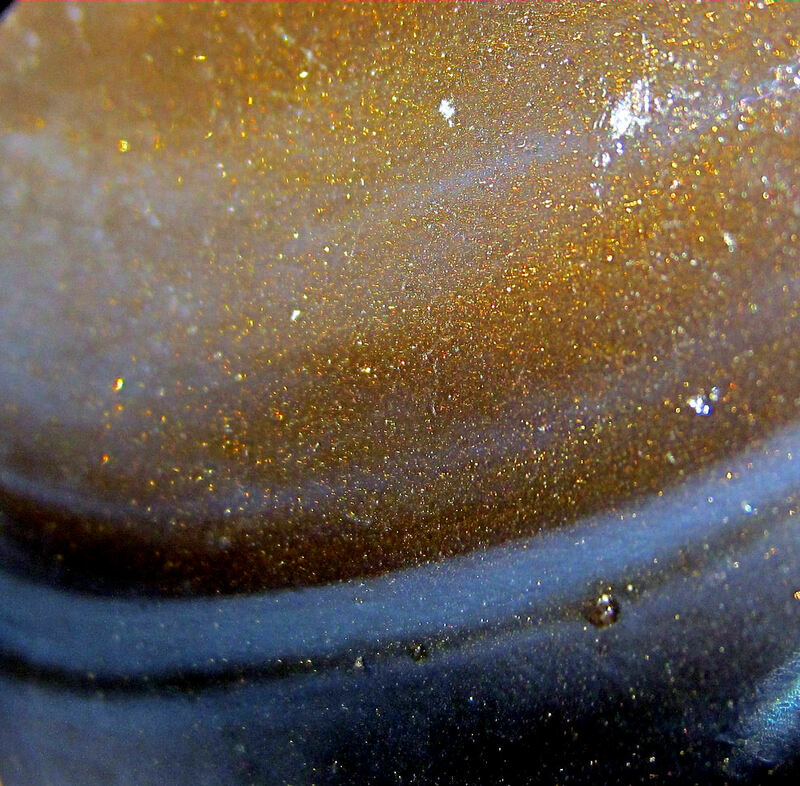 A close look at the large end showing swirly once molten layers of color. The base side showing the patches of once molten iron. This is one of my favorite pieces. This is yet another piece with extreme character. The mosquitoes weren’t too bad on the creek most days, but here’s one that really ‘Bit’ me. I love the blue glass eye contrasting the brown one. 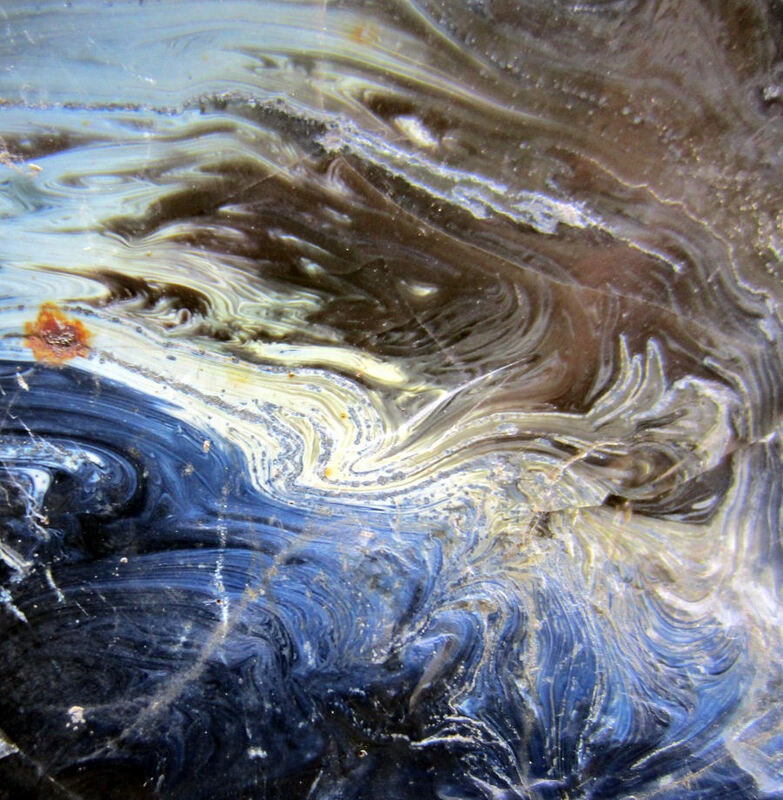 It’s rare to find a piece with two different colors separated from each other, as most seemed to swirl in a mix. This would make a very artsy paperweight on any desk. It’s 3-1/2″ long by 2-1/2″ wide and 2″ high. I can almost hear that annoying buzz when I look at it. 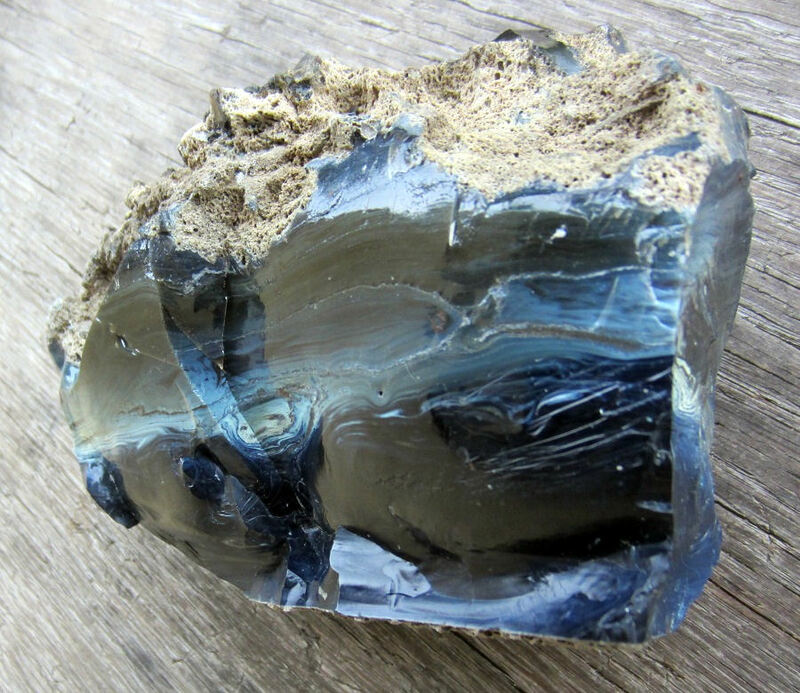 This was the first nice piece of character slag glass I found. It’s also my prize piece. The odds of this piece being naturally sculpted to a snake’s head in such an artsy way are astronomical. I think an abstract artist sculpter would be very hard pressed to top this. It weighs just shy of 2 pounds and is 4-1/2″ long and 3″ high. 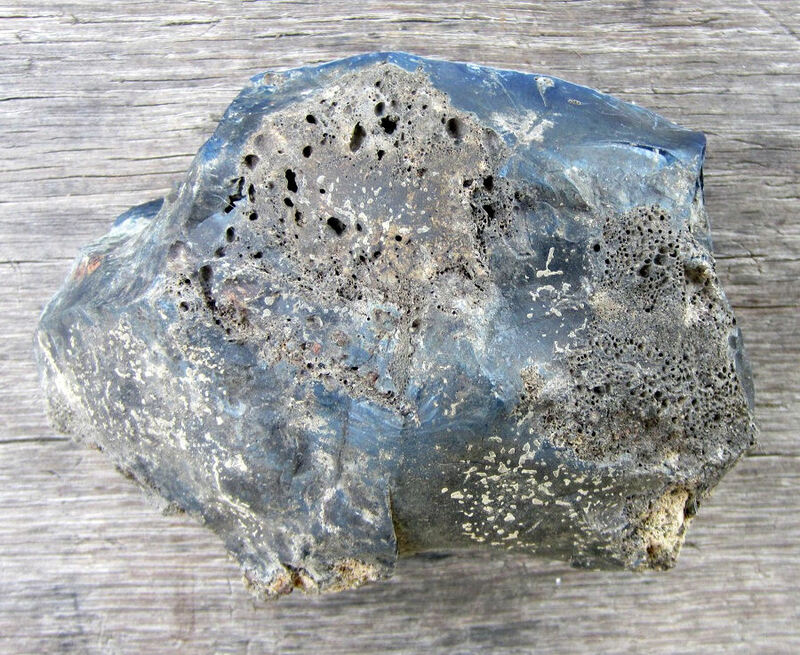 I had picked it up dirty and showed it to Dave saying, “Wow, here’s a neat piece of blue fieldstone slag.” I didn’t look at it too closely, but simply wrapped it in a plastic bag and into the backpack it went. It was later, at home, when I was cleaning the dirt from it that I noticed just how special it is. Especially in the sunlight. Straight on looking at you. Overview. The colors of sky blue to dark like night and day. The back illustrating the temperature changes. Note the natural stone at the very base making its way to pure once molten glass at the top. Base view showing complete natural stone. This resembles a snake’s head from every aspect. The top has a very interesting feature that is quite beautiful and has depth into the piece. Like something from outer space, this is quite a find. It’s going to be hard for me to top this piece of waste byproduct from the primitive production of iron in the mid 1800’s. Having beamed back down, I’m still exploring this creek further. There’s so much more here than the furnace and its artifacts. I managed to locate some 1800’s dumps, and those will be another story. I remember the excitement of being eight years old and finding that whopper of a crayfish and I’m glad that thrill of exploring and discovery is still with me. At eight or forty-eight, what’s the difference? I was already ‘Ivy League’ when I was eight. Now, I’m a bit wiser and don’t need the Calamine Lotion.